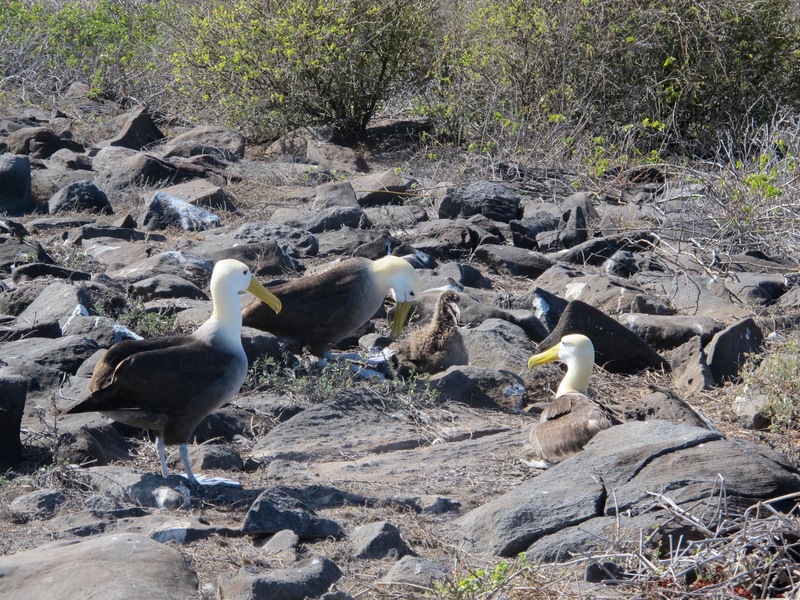 Española is the southern-most island in the Galápagos and is the only breeding site in the world for the Waved Albatross. Although I didn’t see any giant tortoises on Española, there are many. 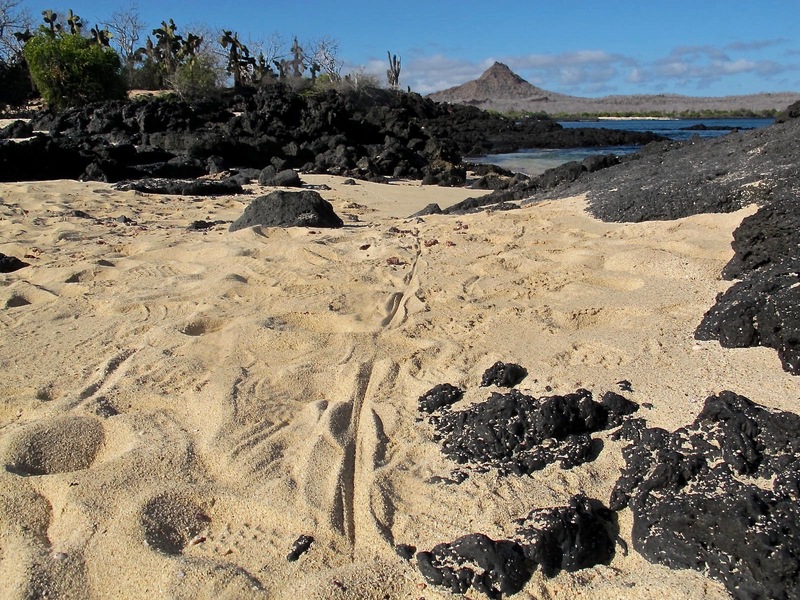 In the 1960s only 14 Española giant tortoises were living on the island. 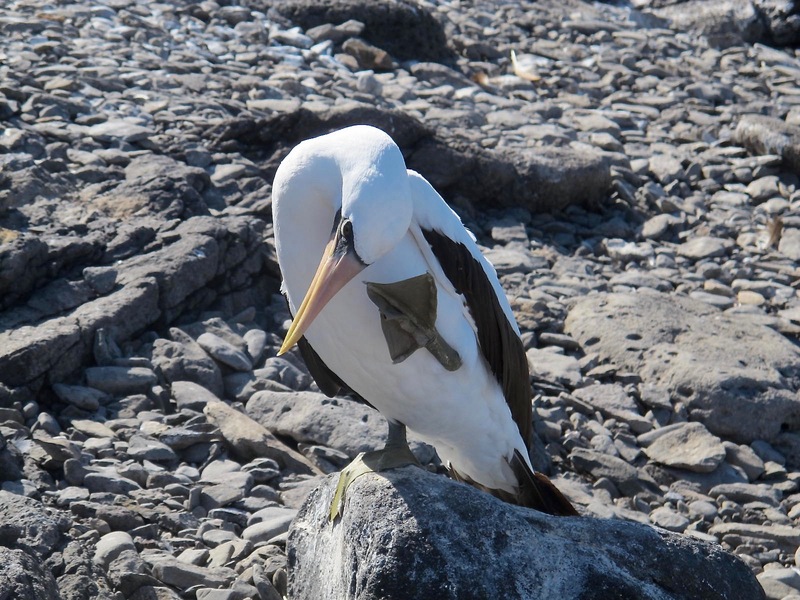 Thanks to breeding efforts at the Charles Darwin Station, more than 2,000 have been released and the species is once again thriving. I vaguely recollect that Super Diego might have had something to do with that. 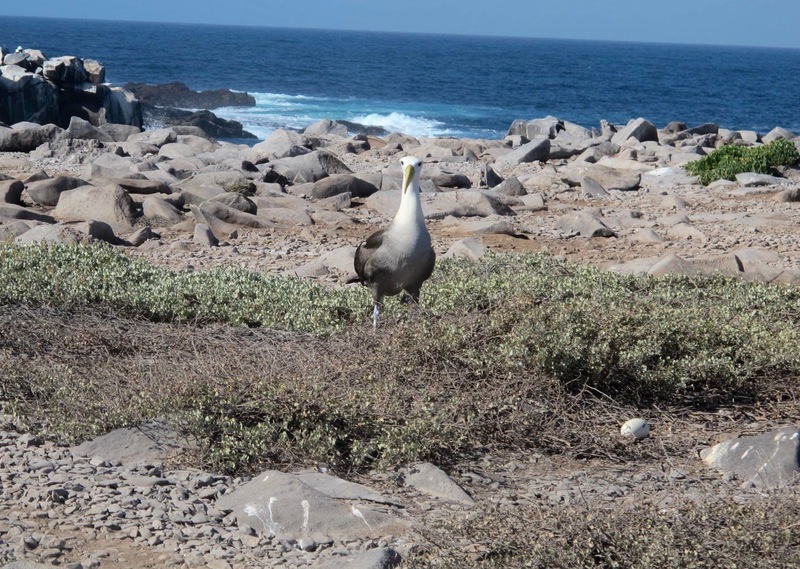 Our first exploration of the day was at Suarez Point that involved a hike to see the Waved Albatross. I was excited to see them up close and personal! As we neared our landing spot, we were greeted by several sea lion pups playing in the water and LOUD barks from a big alpha sea lion. 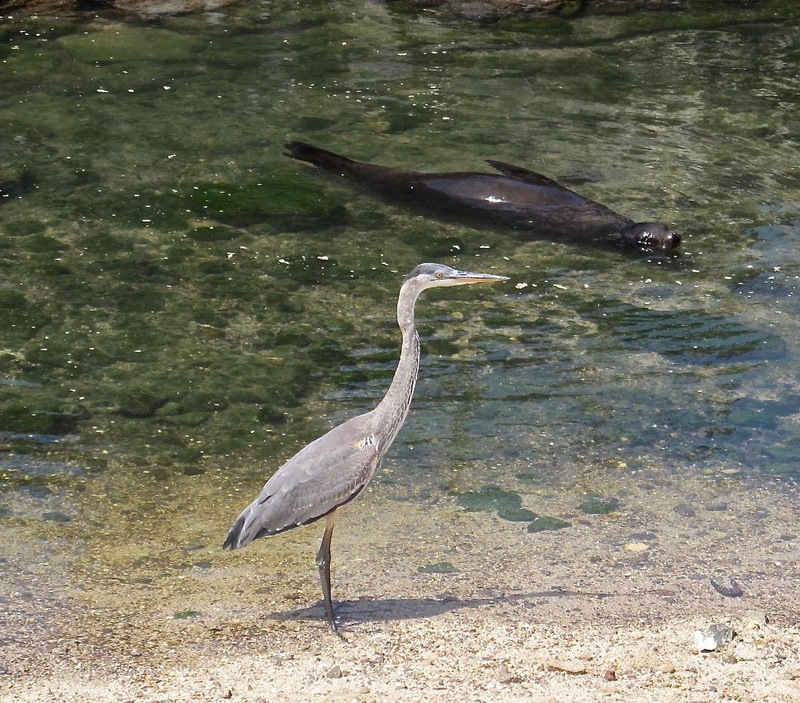 Erick told us the sea lion mamas were out fishing and the bull was a babysitter. He was making sure no one (animal or human) got out of line. Believe me, we didn’t want to mess with him. 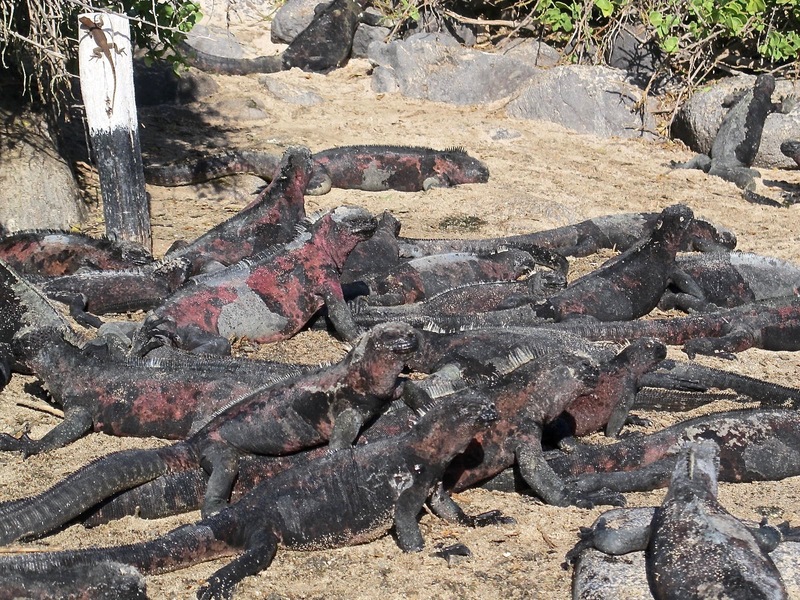 Once we landed, we almost immediately saw a mess (term for a group) of marine iguanas. They were busy getting warmed up enough to go swimming to eat their lunch. It takes them several hours to get warm enough and then can only last about 15 minutes per swimming session. The red on their hides is left over from the mating season. Some were redder than others. Note the lava lizard on the post. 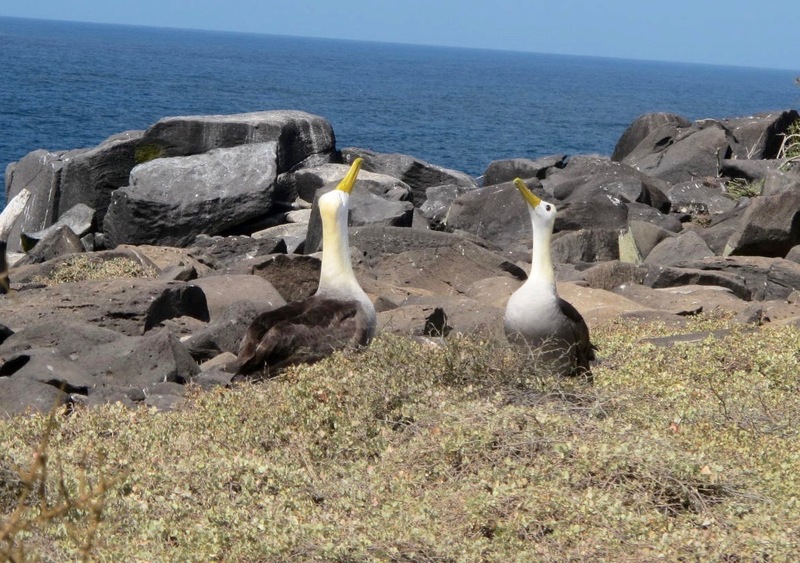 To the right of the white post is our path to the albatross nests, thus forcing us to break the rule of staying several feet from each animal. We just watched our step and walked right by them. They didn’t flinch. 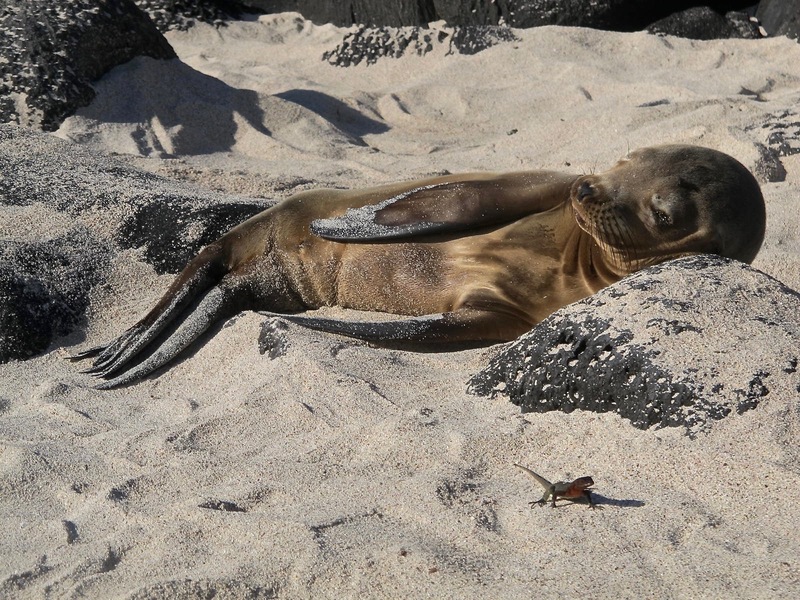 A young sea lion with his buddy, the lava lizard. 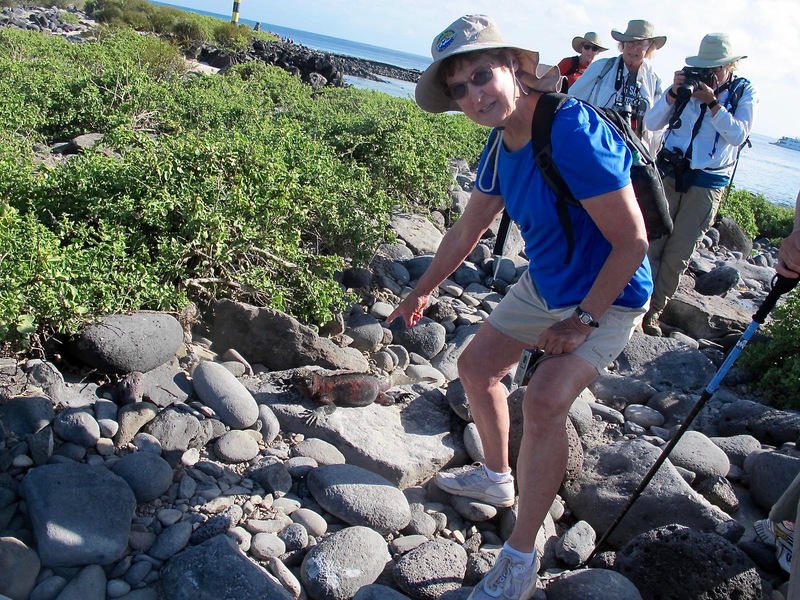 As we walked farther into the trail, we continued to see many marine iguanas and lava lizards. 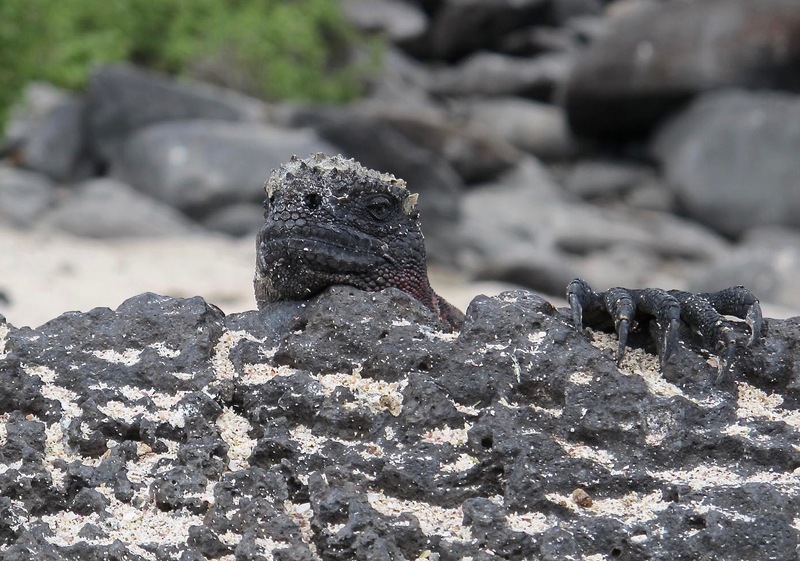 We watch one lava lizard try to court a female. 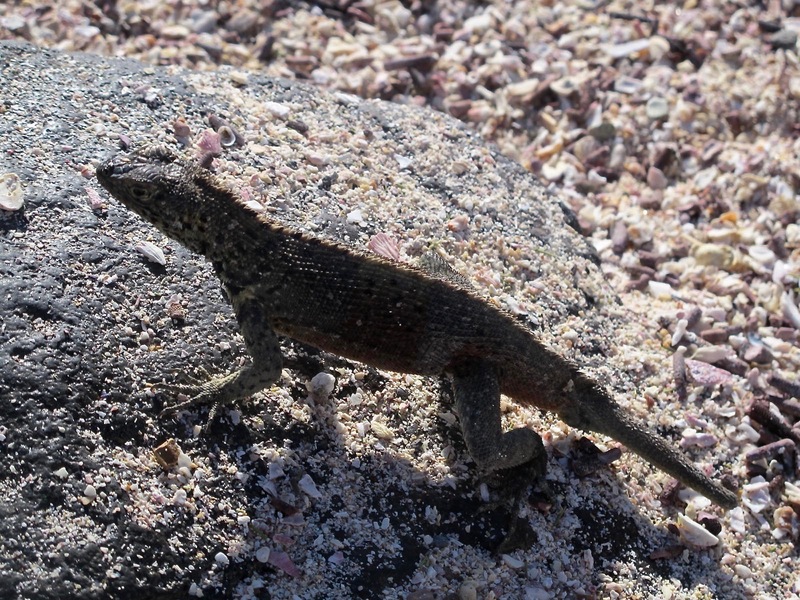 He would do his push ups (as we might have seen lizards in our area do). The female would kind of dance around as I remember and then he’d do some more advancing. But after a bit, the female walked away. He looked dejected but perhaps he because his tail was short. Perhaps he lost it in a fight or maybe a bird tried to get him. 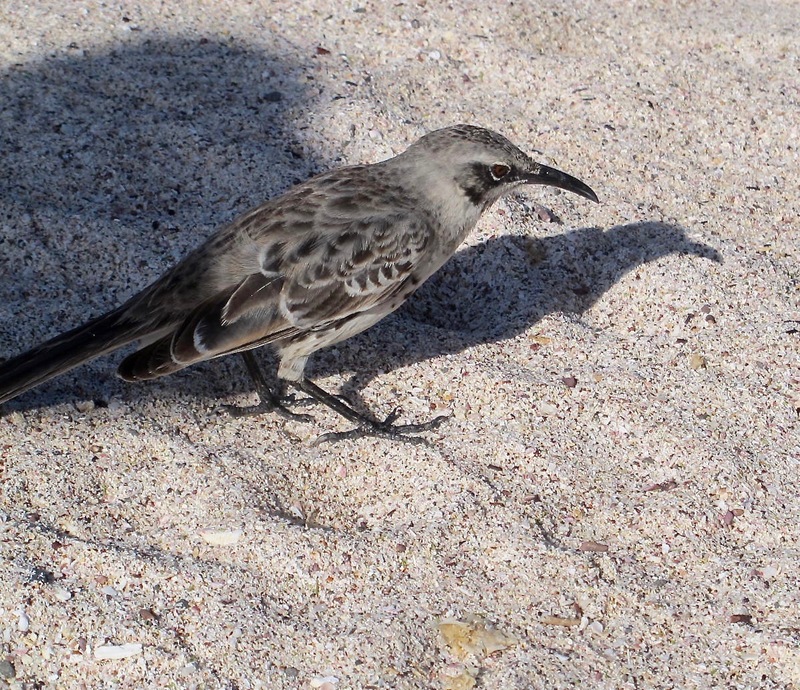 Speaking of birds, we saw the Española mockingbird with his curved beak. 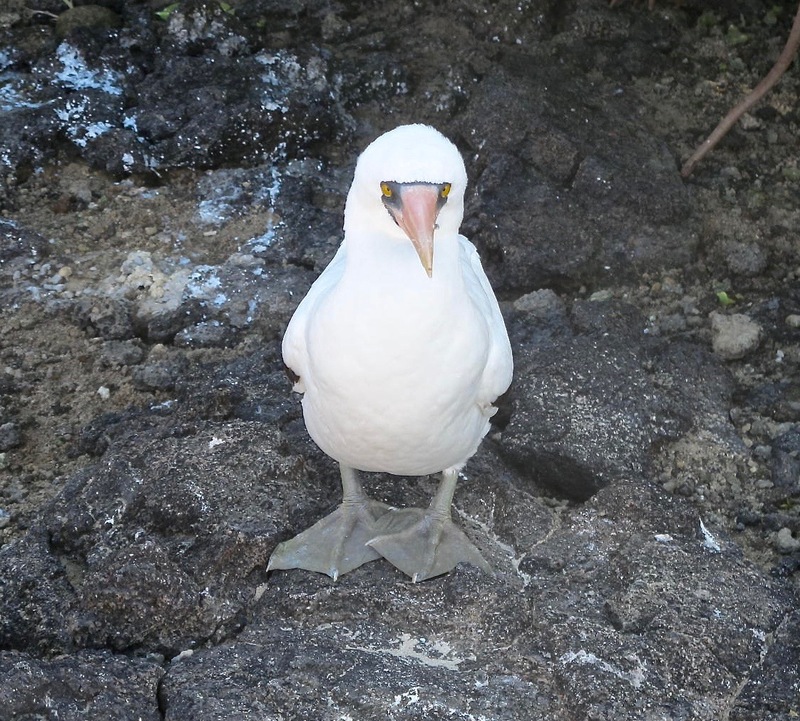 He, too, was as curious as the Galápagos mocker we had seen on other islands. He would walk right up to us trying to check out our gear. Soon we left the easy sand and began to walk on a pretty rough path. 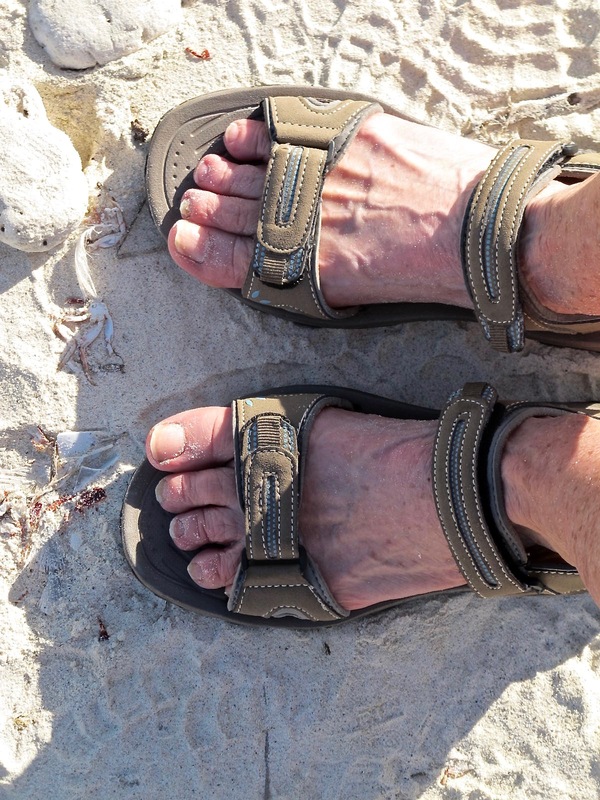 We all had to watch our step…for more than one reason. 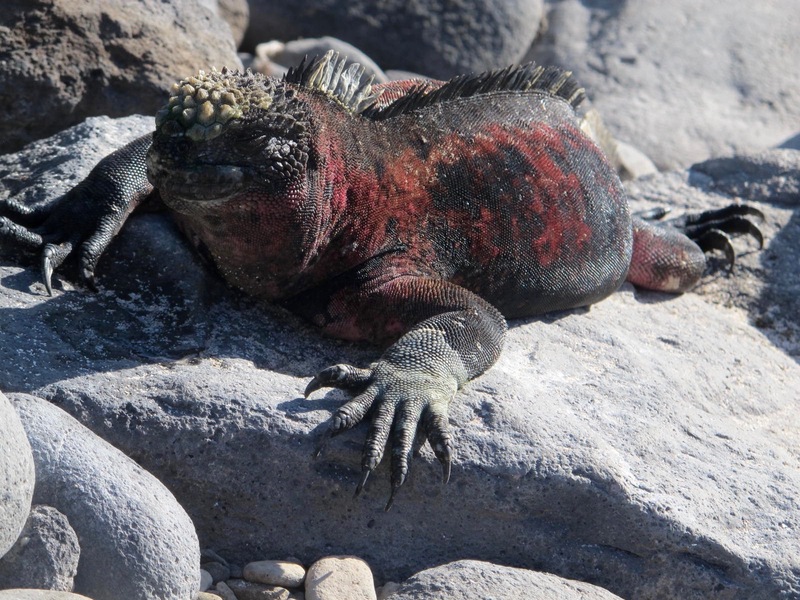 A marine iguana and a seal lion were on the path each doing it’s own thing. It didn’t take long before we were seeing birds all over the place. This magnificent blowhole might be the tallest one I’ve ever seen. But, then, it was difficult to get a perspective of size because we were looking down on it. The red spots around the blowhole were Sally Lightfoot crabs. 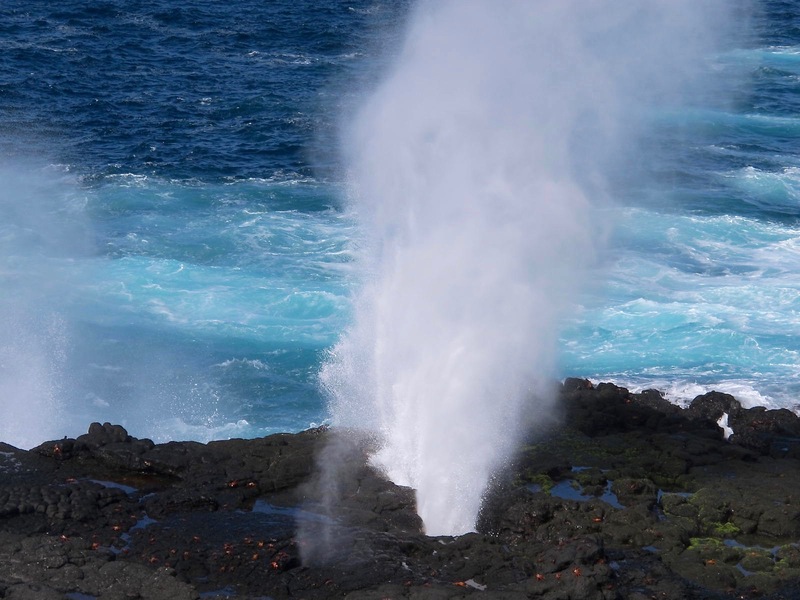 I wonder how often they crawl too far down the blowhole and get blown up in the sky. 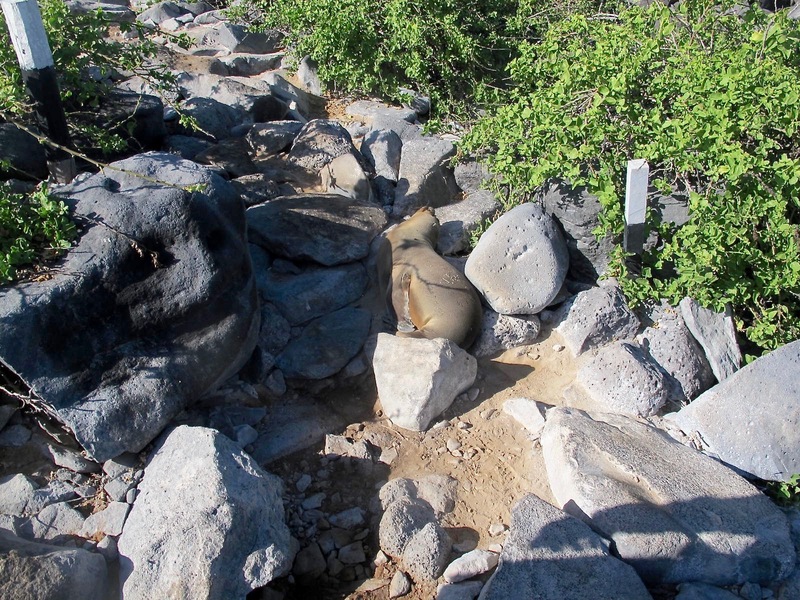 I turned around from the blowhole and saw these Nazcas sunbathing in rays of light. 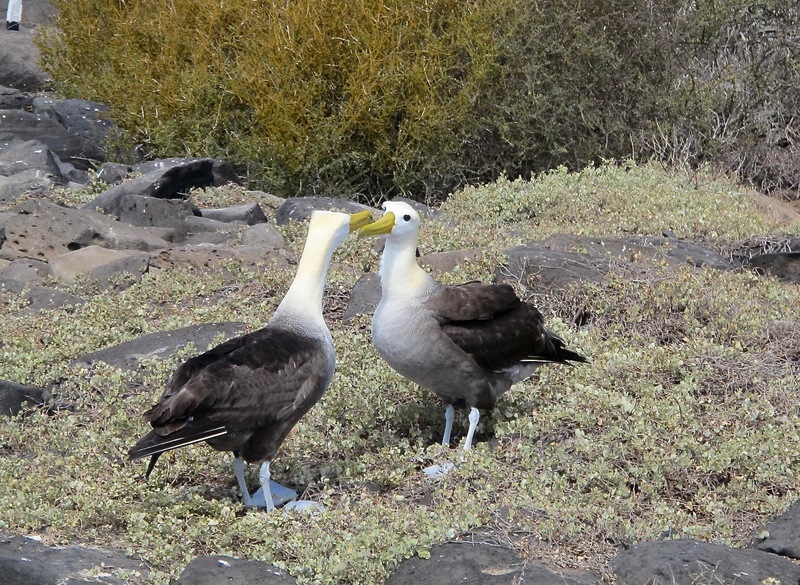 We walked a bit farther and saw albatross and their chick. What a great sight! The chicks aren’t very cute but they do grow up to be beautiful birds. 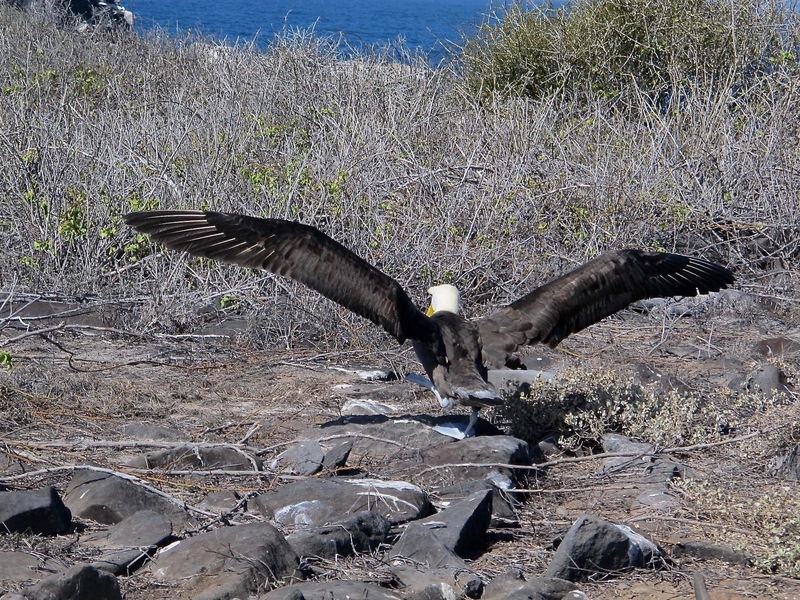 Erick thought the egg didn’t belong to this albatross, but it still makes a good shot. 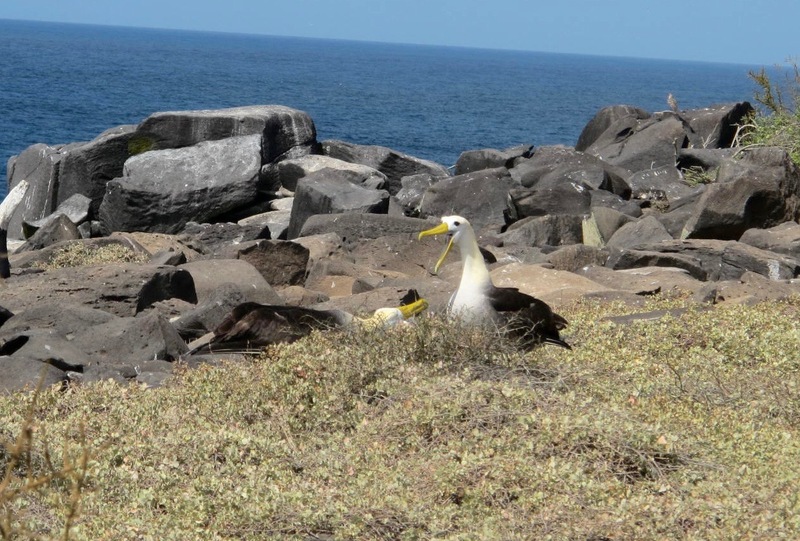 Right in the midst of all the albatross was a marine iguana high on a bluff. I wondered why he was so high above the surf line. Shirley and I took advantage and had our portrait taken with him. 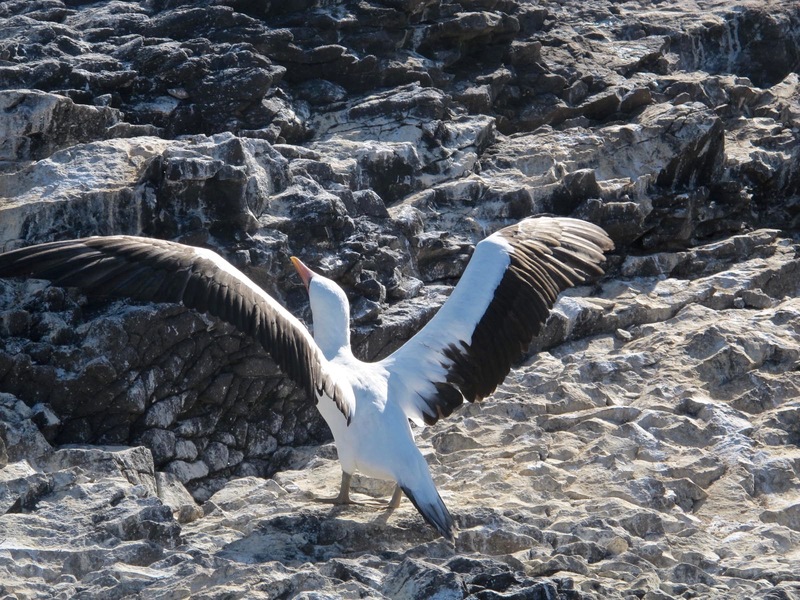 We were privileged to see two pairs of albatross do their mating dance and even though I felt like I was intruding, I took some photos of them. This dance is quite elaborate and these are just four steps to it. I was quite impressed to watch it but I don’t know the outcome. Did she or did she not accept? A picture of an albatross doing his version of running fast enough to get enough lift to take off. 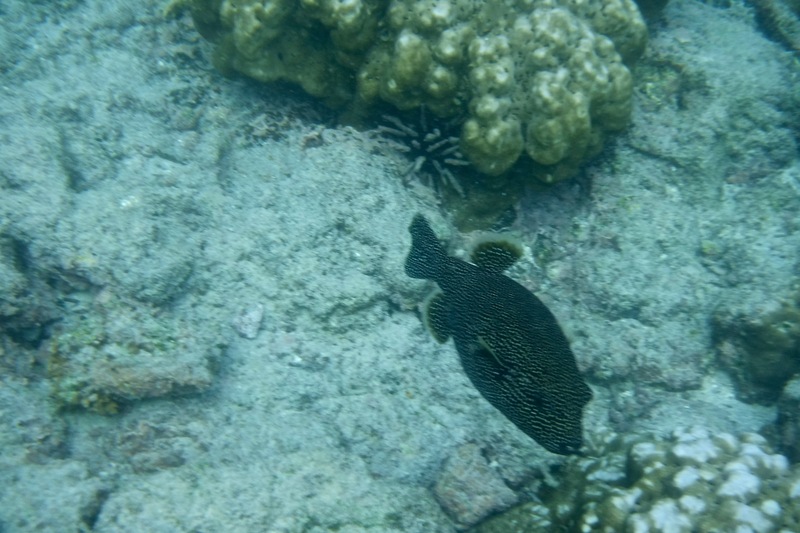 On the way back to our Zodiac, I took this picture of the “Creature from the Black Lagoon.” Note how sort of smushed its face is. 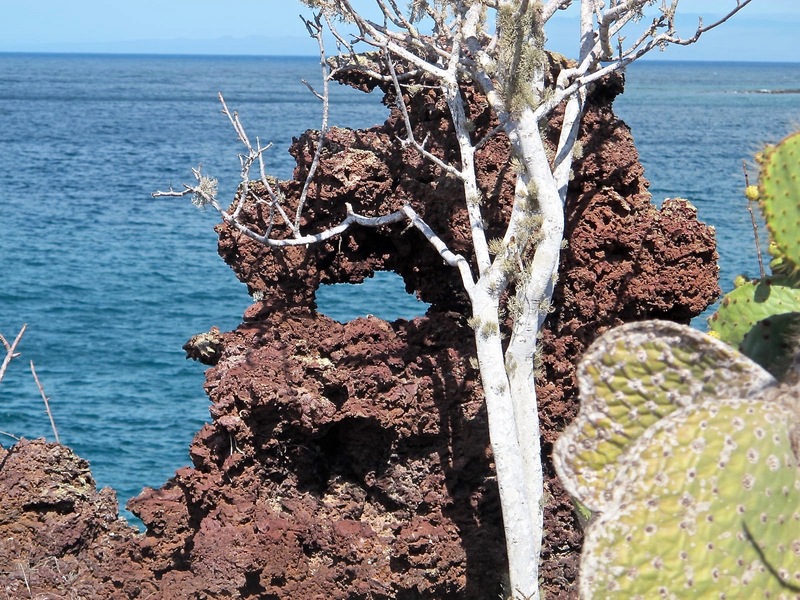 This is an adaptation that allows the iguana to crop the algae even closer to the rock. 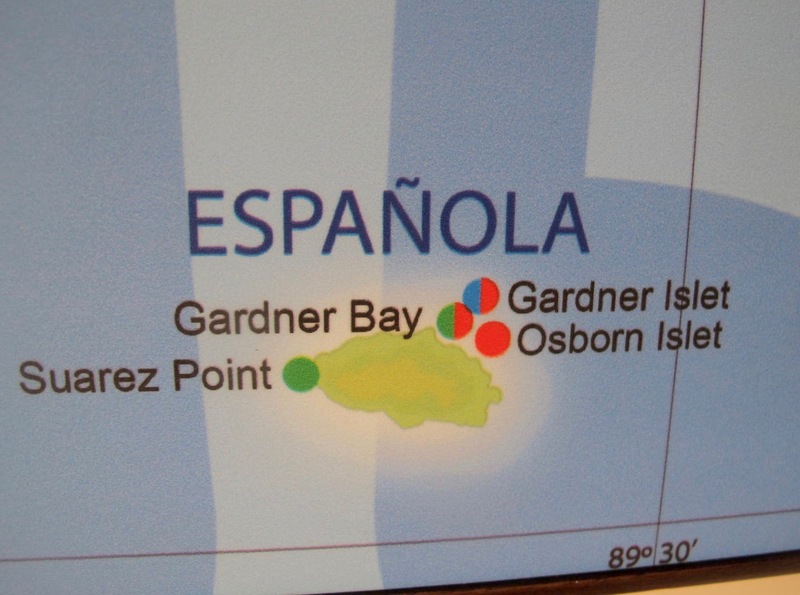 We left Suarez Point and sailed to Gardiner Bay, on the eastern side of the island. 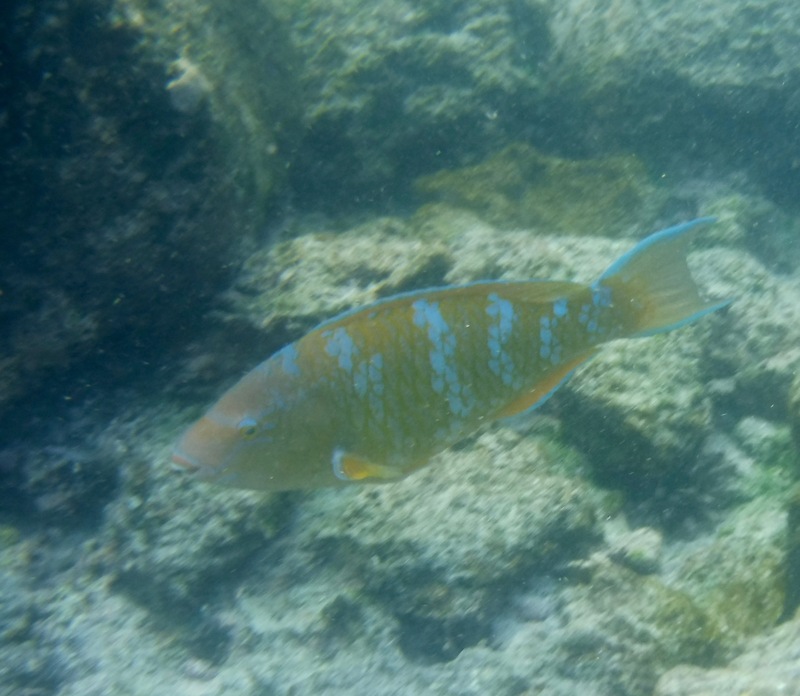 This was our last chance to snorkel and see some fun animals. 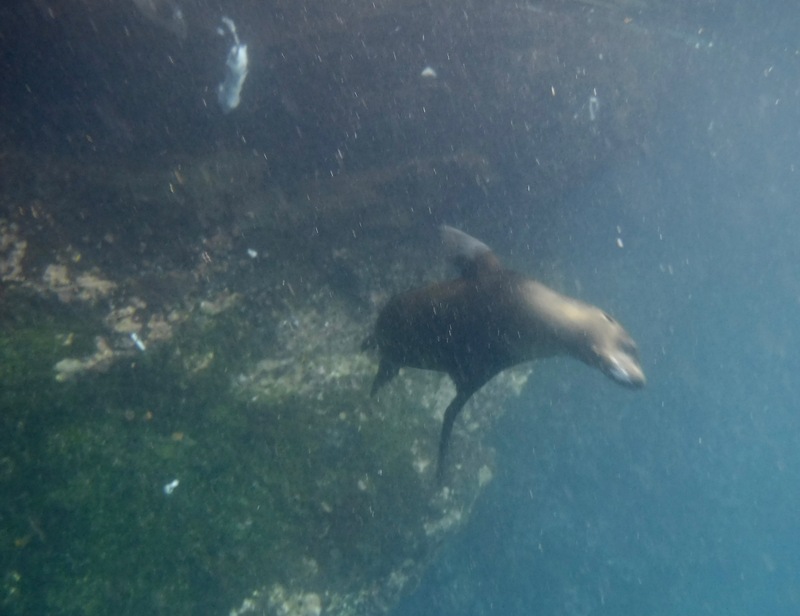 Pato took us into a cove where we were greatly entertained by sea lion pups. They were learning how to fish were often successful. One guy would take his catch up on the rocks and proceed to whack the poor fish on the rocks. Then he would eat it. Perhaps he was tenderizing it. Who knows? The white stuff in the water is parts of fish. You might be wondering why we wore wetsuits when we were so near the equator the entire time. A good question. We learned that cold, strong currents from Antarctica were flowing into the area and meeting northern currents. 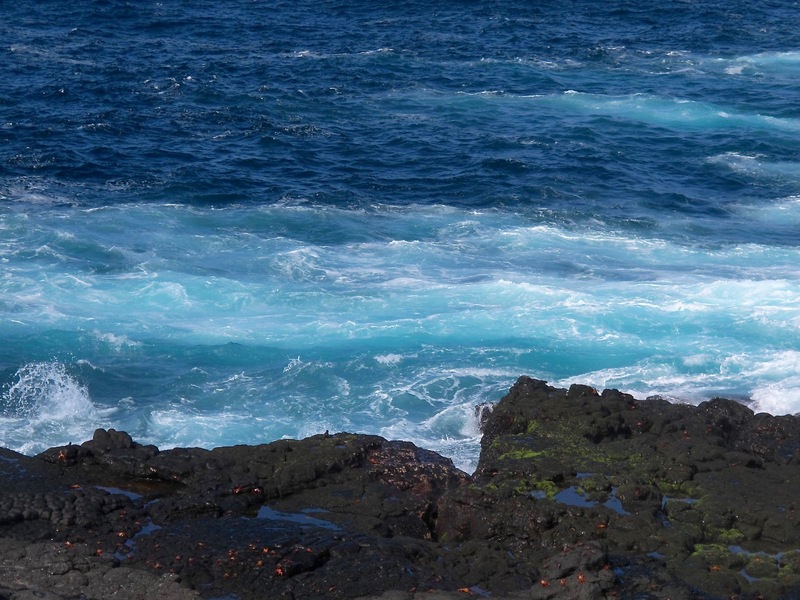 This caused a welling of particles in the ocean that brings fish and birds. 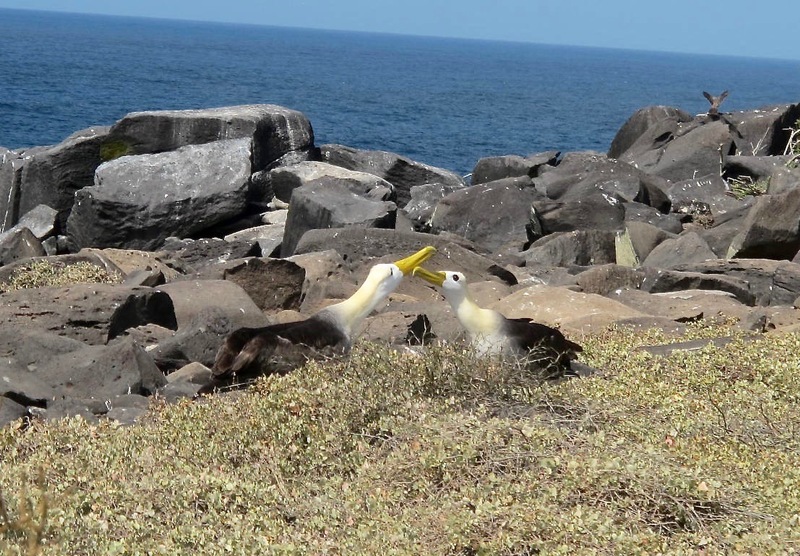 That is one reason why the Islands teem with birds and fish. Genovesa was relatively warm but Española was a lot colder. That blotchy white thing in the left side of the rocks is a pup beaching himself. 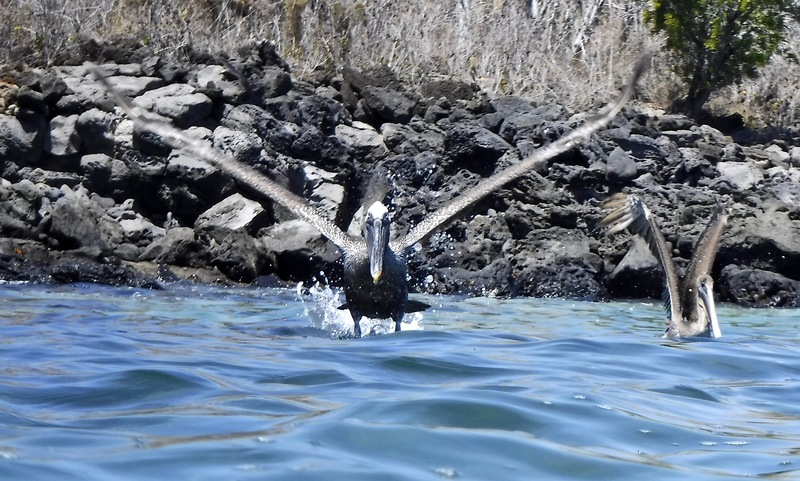 After our adventure with the sea lions, we had some time on Gardiner Bay beach and then we boarded the Galaven to head toward San Cristobal. 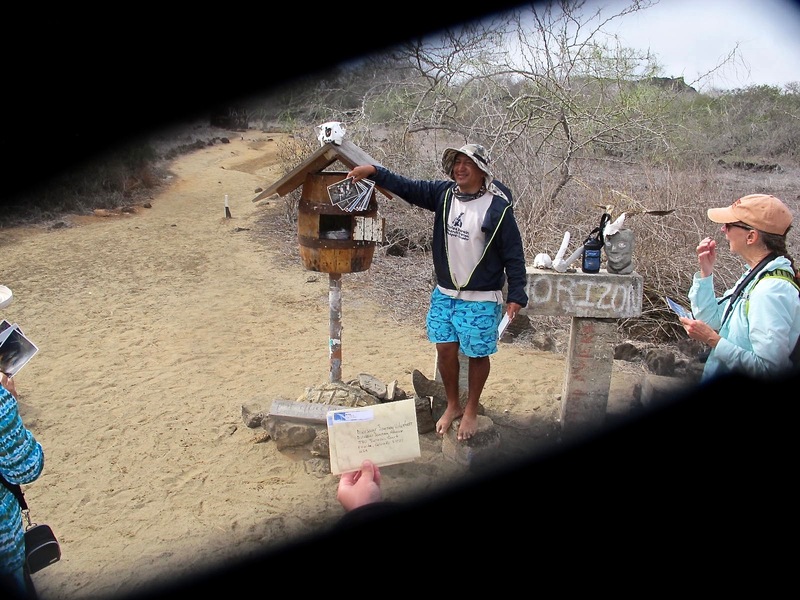 We discovered we had some hitchhikers on our voyage to San Crisotbal. 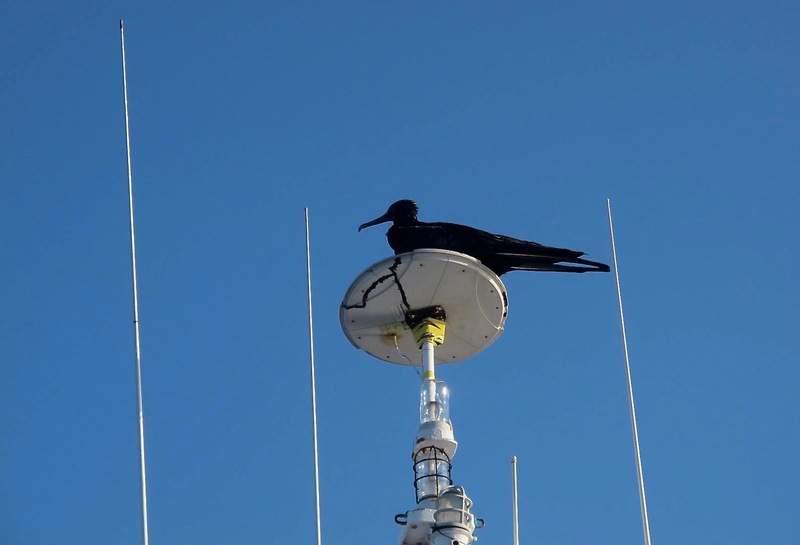 A female frigatebird on the radar mast. She fought off a male who wanted to roost there. 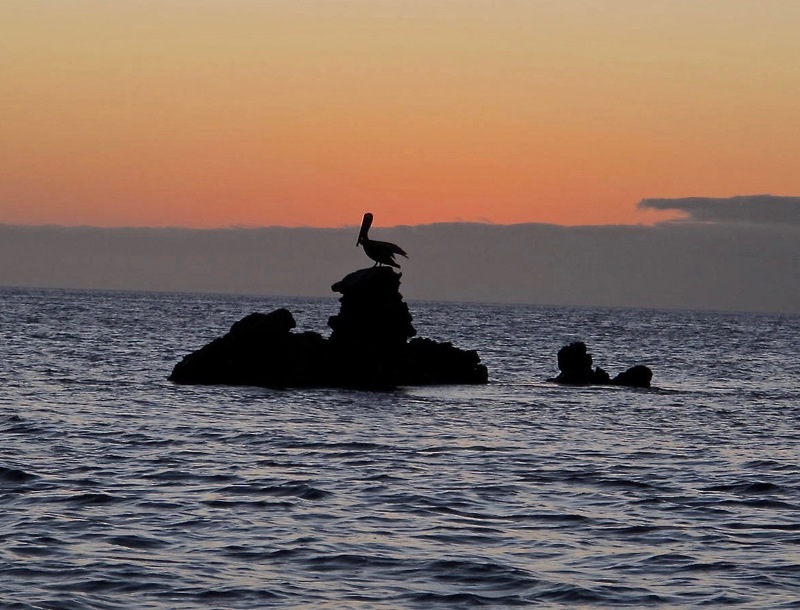 A pelican on the crane. 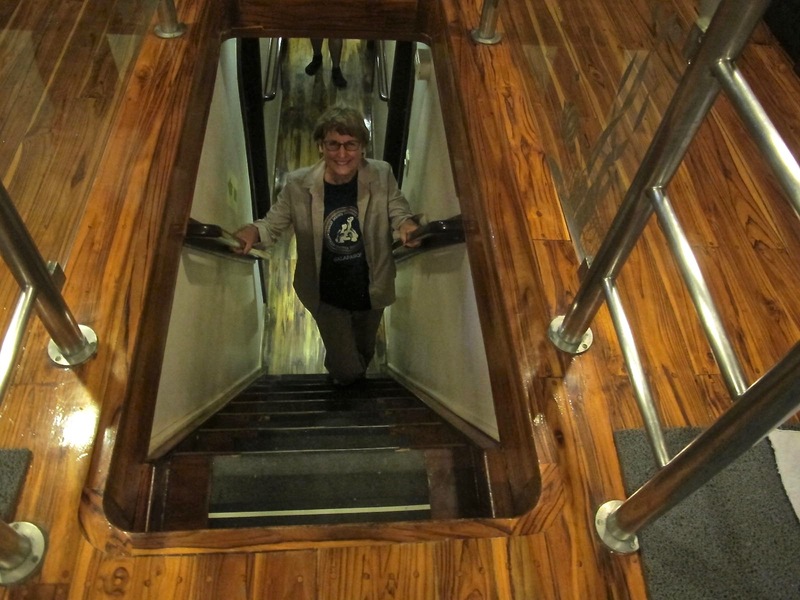 Throughout the voyage, all of us who lived below the main deck would go up and down these steep stairs. If you went down straight, your calves soon became bruised from banging on the narrow steps. I ended up going down sideways quite often to avoid those bruises. Shirley is at the bottom of the stairs to indicate their steepness. 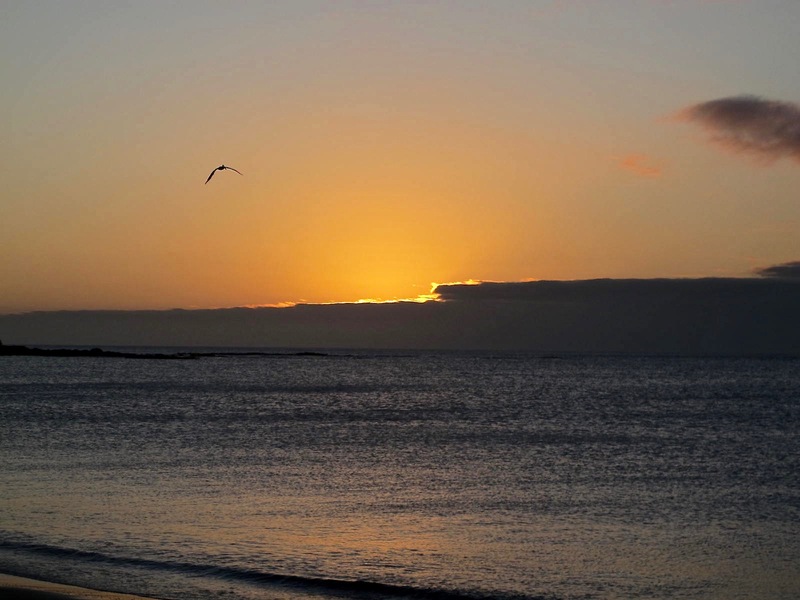 A nice sunset, but we didn’t see the green flash. We woke up the next morning in Puerto Basquerizo Moreno on the Island of San Cristobal. 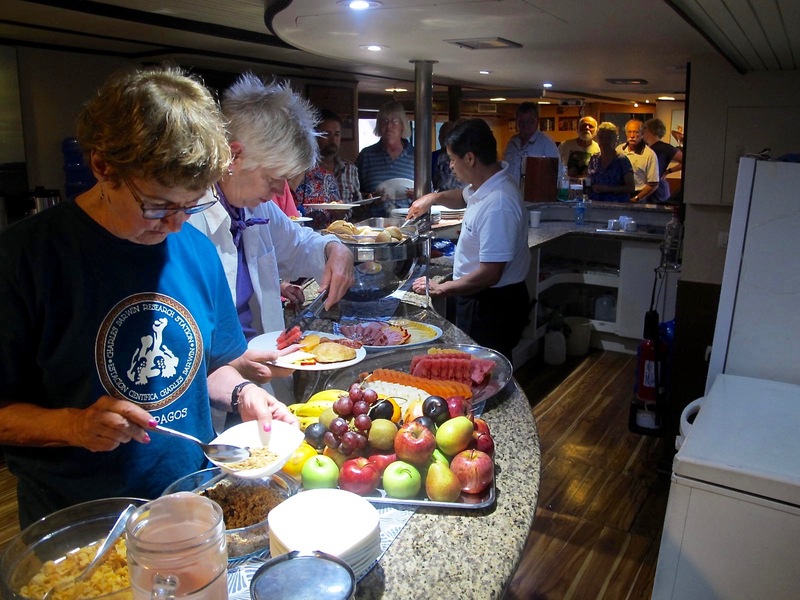 We ate our last breakfast aboard the Galaven and left our gear for the crew to take to the airport. We all went to the Interpretation Center where we enjoyed expositions on natural history, human history and conservation. 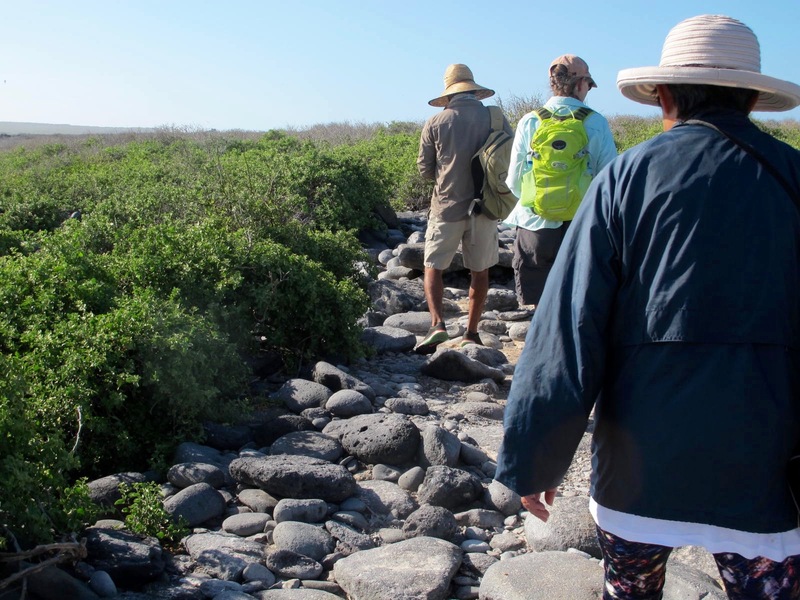 We had been hearing about conservation the entire trip, as it is so important to protect the wildlife and natural environment on the Islands. A great blue heron in the port. 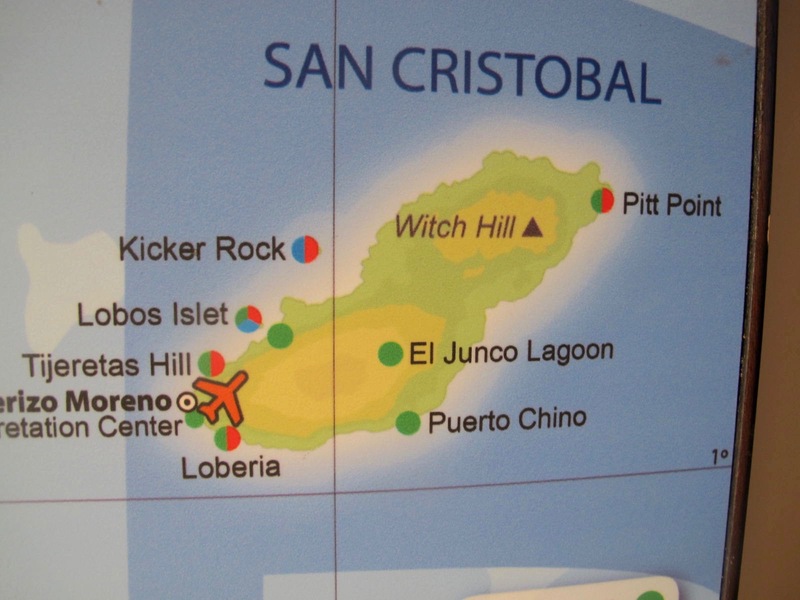 That afternoon, we took off from San Cristobal and flew to Quito to spend the night. We rose again at the ungodly hour of 2:15 to get our bus back to the airport to get ready for the flight from Quito to Miami. It was a very long day that didn’t end until midnight at Shirley’s place in Grand Junction. But it was worth it! I loved the trip and would do it again. I want to thank Julia, our mighty tour leader, who provided us with some great handouts and clues about the trip. I have shamelessly plagiarized from those notes to give some of the historical perspective. Julia organized a great trip and we all benefited from her research and preparation. Pato at Post Office Bay when my lens cover didn’t open up all the way. What happens when you don’t follow directions. Passing by a cloudy island. Wonder if it was raining. I forgot that Dragon Hill and Bachas Beach were on the island of Santa Cruz or would have included this part in #3. 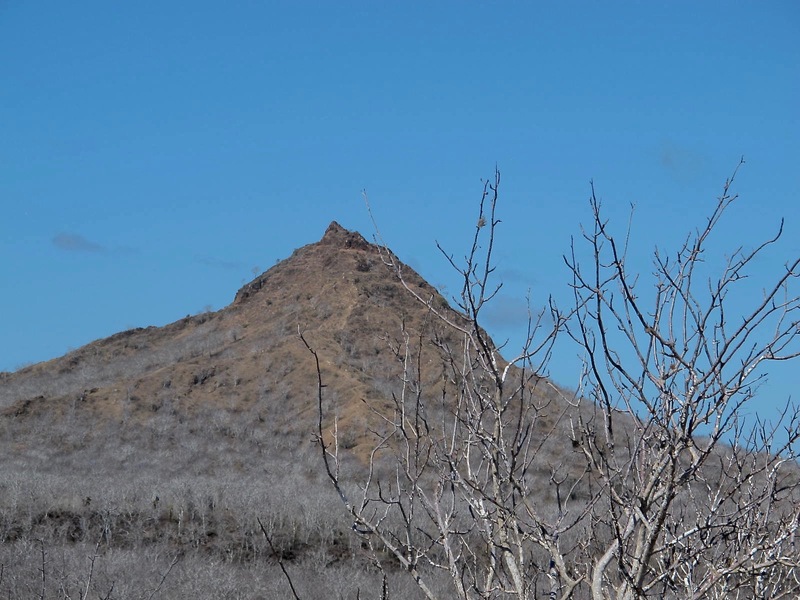 Dragon Hill is one of the newest visitor sites accessible to tourists in the Islands. 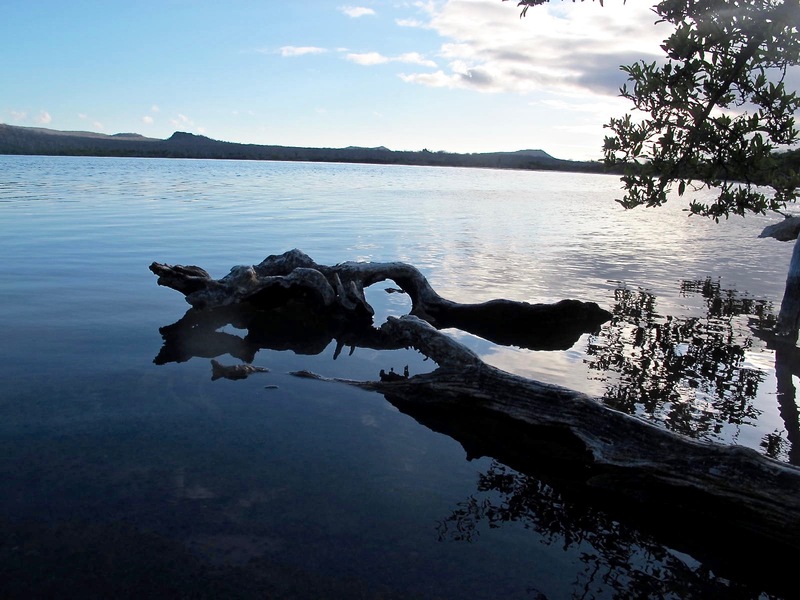 One of our longest hikes took us along a beach and up a trail to the lagoon lookout where the view is wonderful. 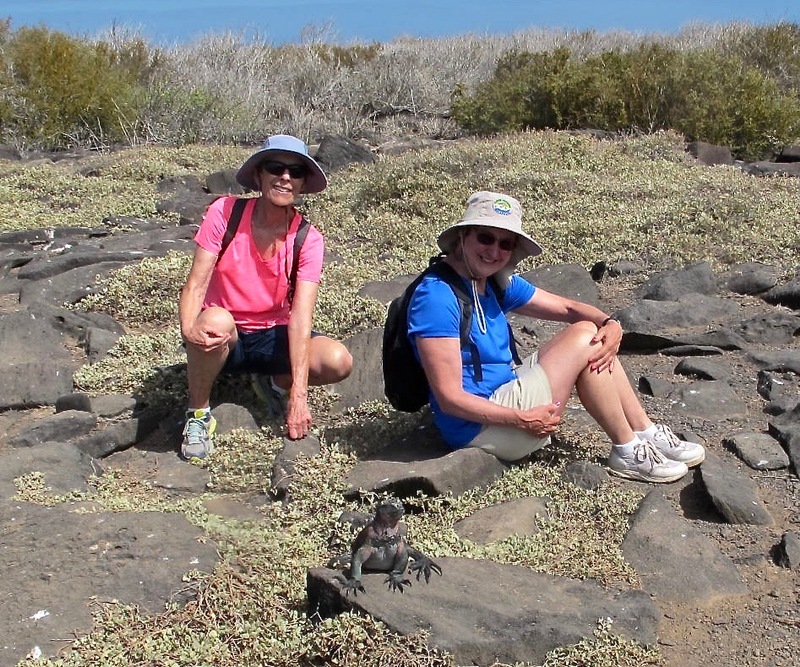 On the way, we saw some marine iguanas, black headed stilts, herons, native cotton plants (amazing to see tiny bolls) and land iguanas! We learned that they don’t have sweat glands and secrete salt from their eye socket. 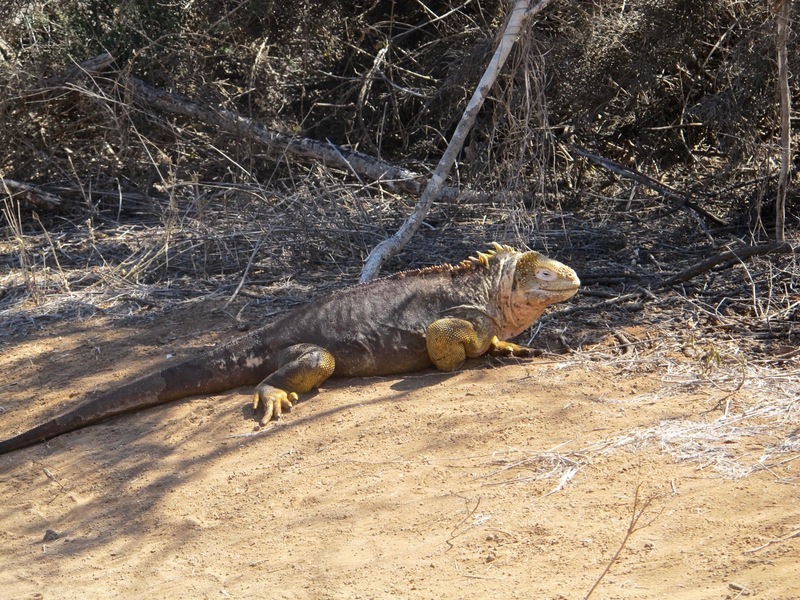 It accumulates around the eye and when there is enough, the iguana shakes his head and off it goes. 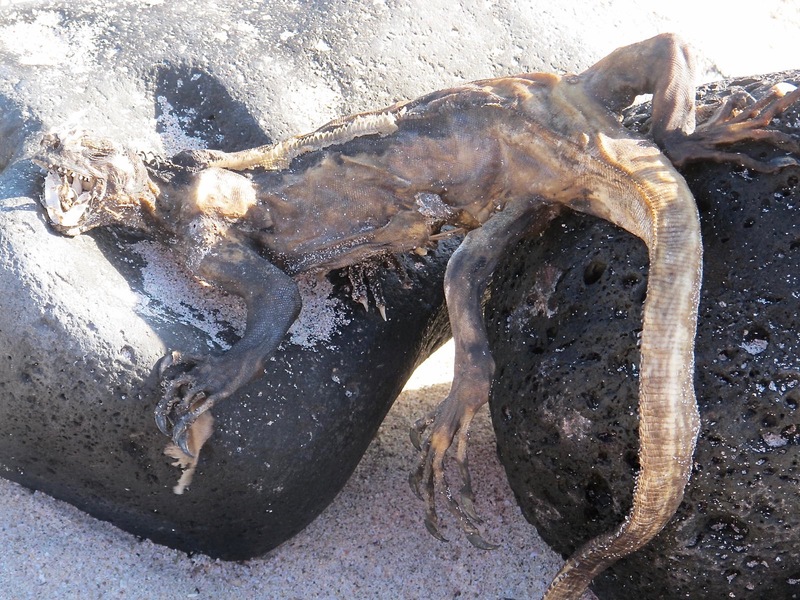 I saw it happen once and thought that could add to the scary image of the iguana. We walked right by them and they just looked at us. They appeared to be very docile but perhaps they could move quickly when they wanted to. We didn’t want to find out. 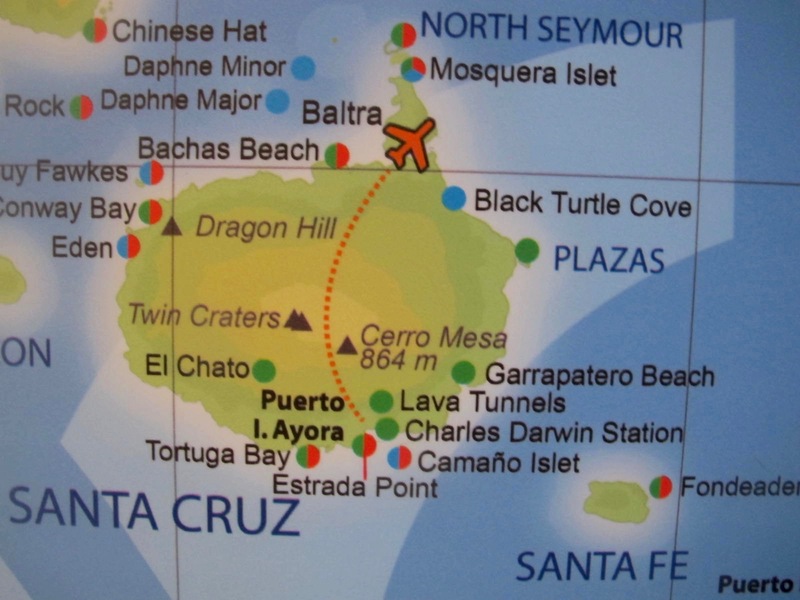 Dragon Hill or Cerro Dragon. 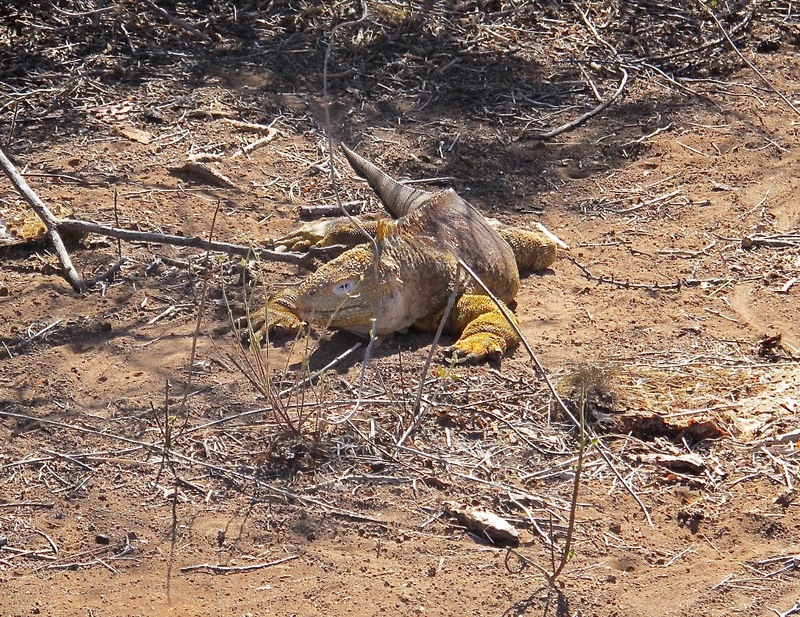 Land iguanas are bred under captive protection at the Charles Darwin Research Station on the southern side of Santa Cruz. We saw a few of them in pens the previous day. 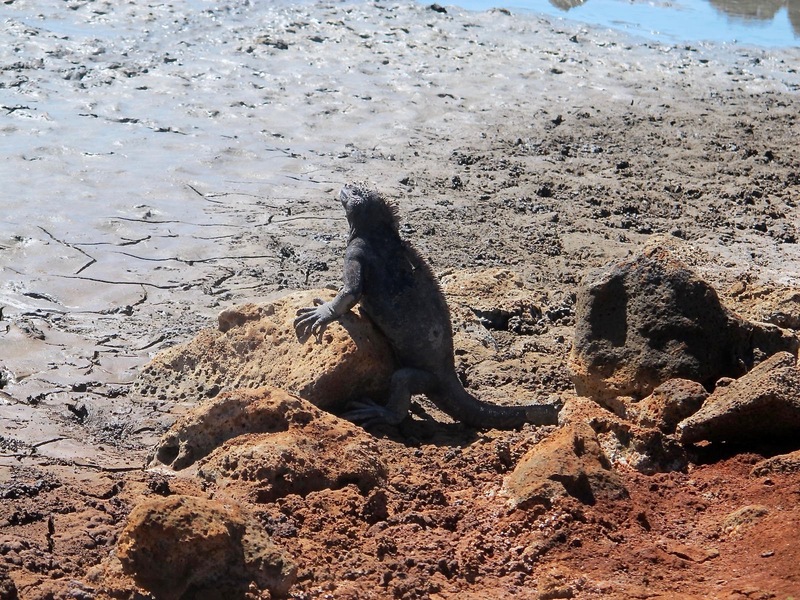 Once the iguanas have safely reached a size to be able to fend off wild dogs or cats, they are released into the wild on the northwestern side of Santa Cruz, so that the species can again take up residence on Cerro Dragon. Later that day we went to Bachas Beach. 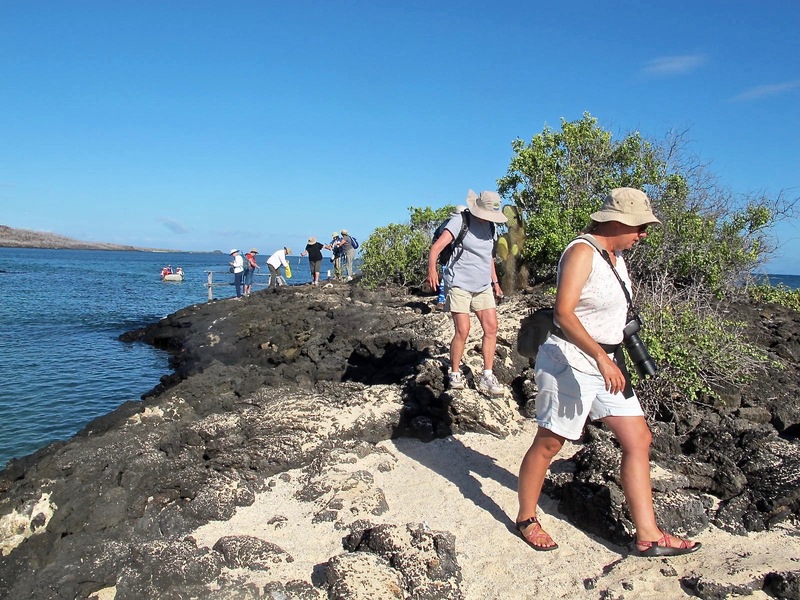 Some folks swam and saw some more penguins and sea turtles. 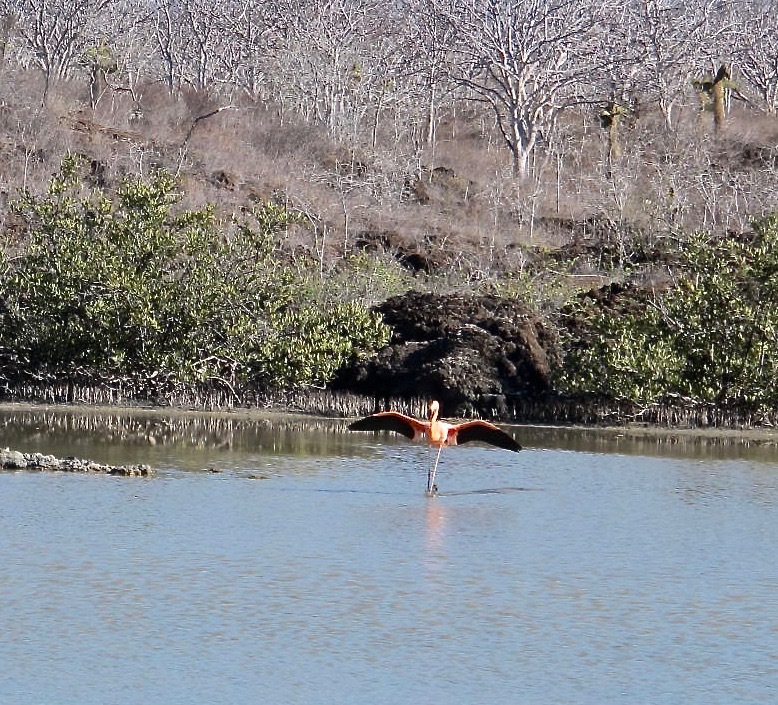 BUT, I did get to see a flamingo landing in a muddy marshy area and that was pretty cool. I was so excited about this bird that I took more than 40 pictures of him landing and then walking around. He was quite a distance from me, so the pictures have been cropped a lot, but I think he shows up ok. 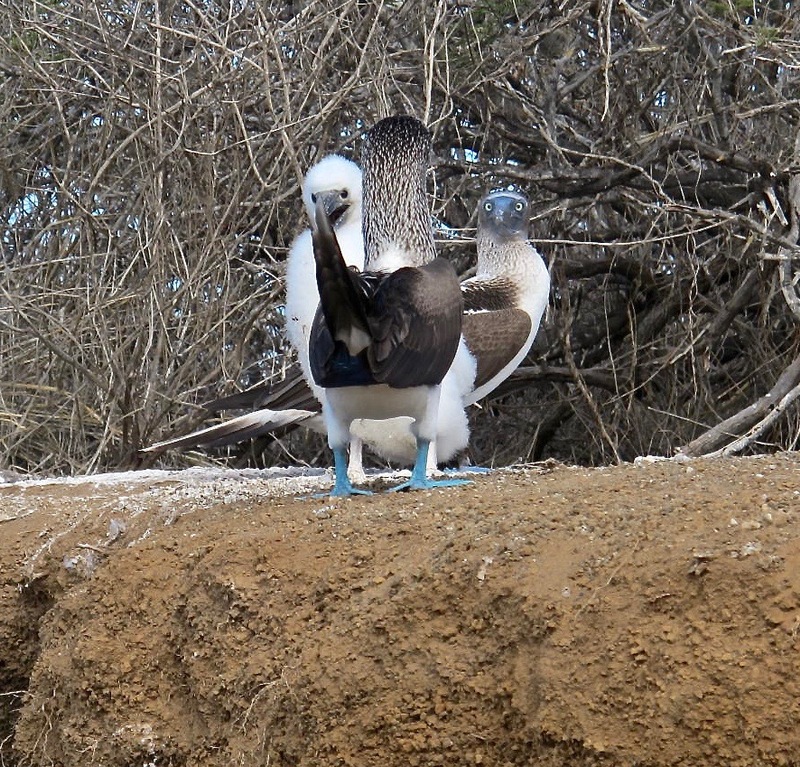 This was another highlight of the adventure that made me very happy I went to the Galápagos. 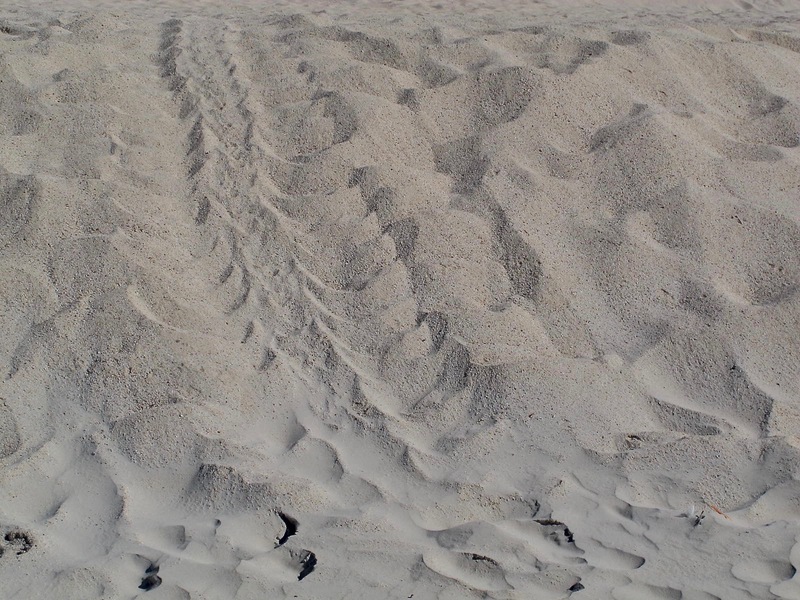 Bachas Beach is noted for a nesting place for sea turtles and we could see tracks of mamas who were going up the sandy berm to find a perfect place to lay their clutch of 100 to 180 eggs. Their tracks reminded me somewhat of a Caterpillar tractor tread. 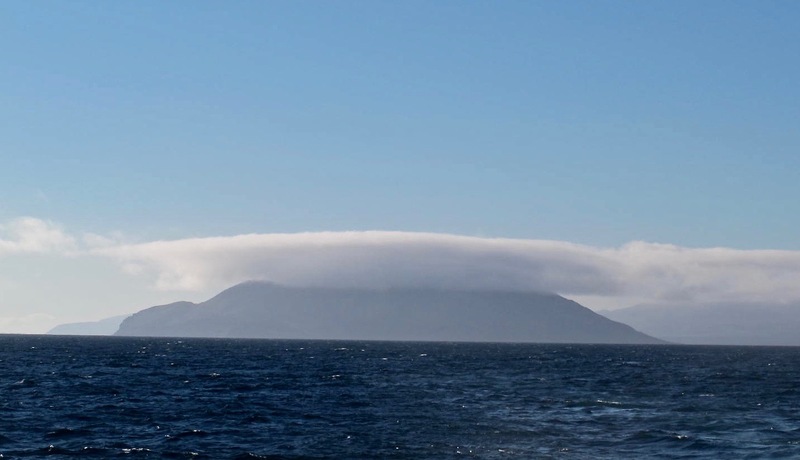 A bit more background of the islands before I talk about our visit to Floreana. 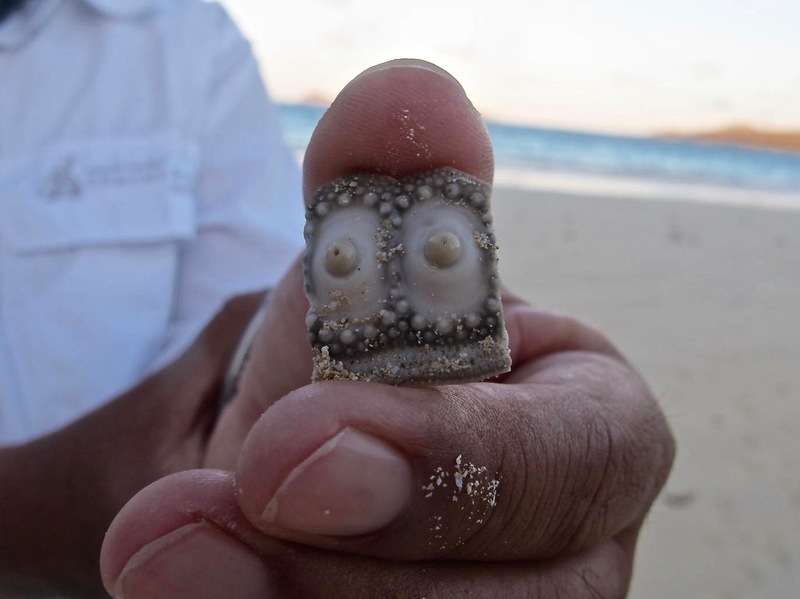 They were discovered officially in 1535 by Fray Tomás de Berlanga (Bishop of Panama). In the late 1500s to early 1700s, the islands were used by pirates as a refuge and base for their raids on Spanish colonial ports. The pirates would stock up on fresh water and tortoise meat, thus beginning the inroads on the tortoise population. 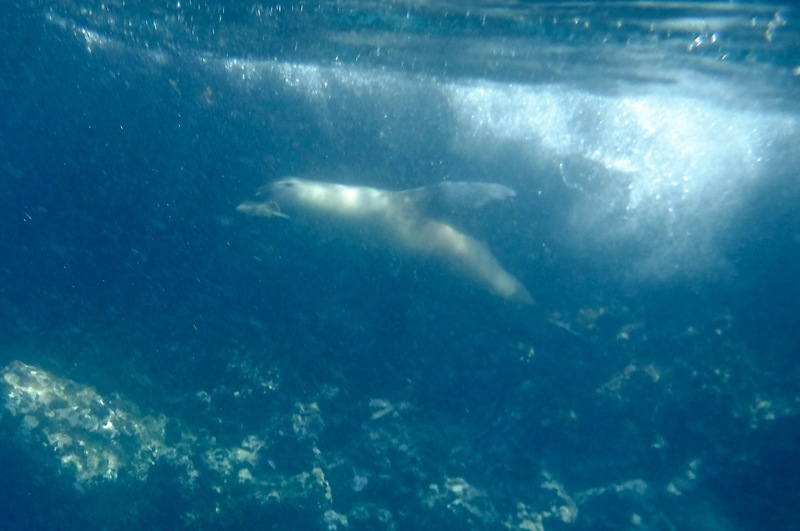 In the late 1700, whaling and hunting of fur seals began in the Galápagos and lasted well into the 1800s. 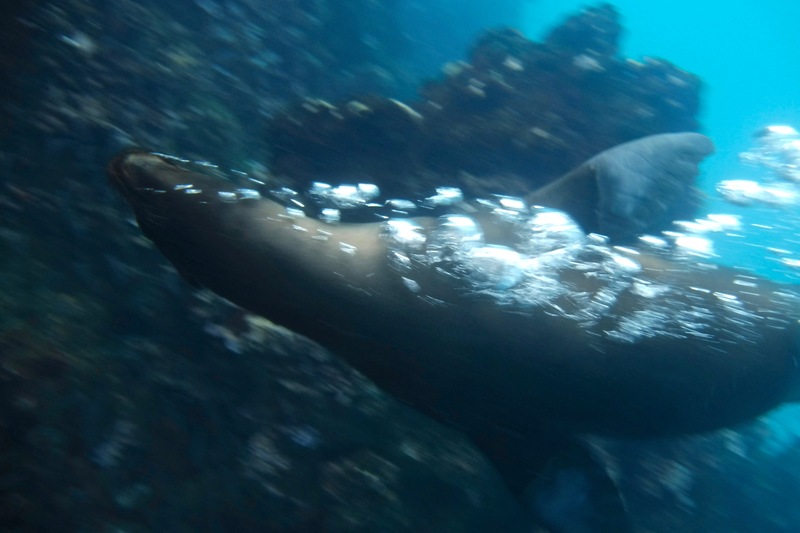 Fur seals were nearly hunted to extinction, whale populations were heavily hit and whole races of tortoises were removed for meat. Some estimates indicate that ~100,000 tortoises were killed during this interval. 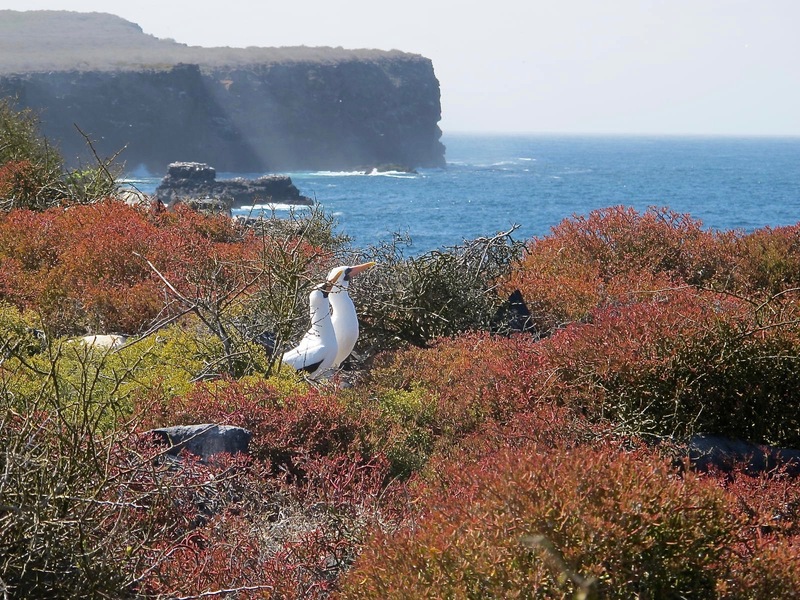 The Galápagos islands were officially annexed by Ecuador in 1832. So why all this background? 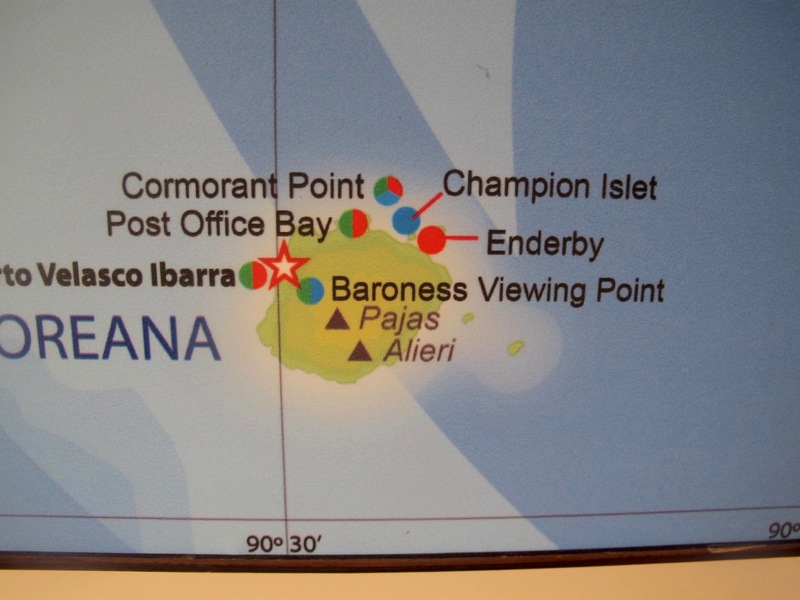 I wanted you to understand a bit of the history that led up to the first place we landed in Floreana, Post Office Bay. 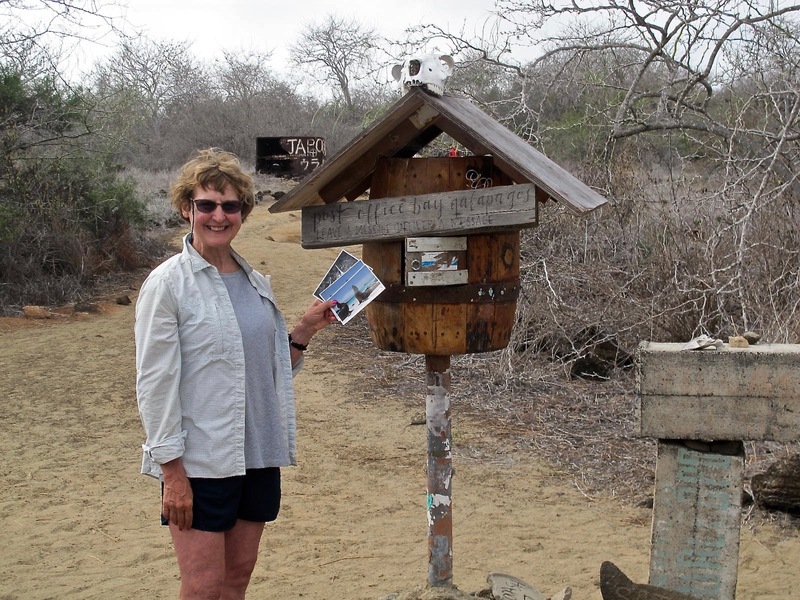 This was the first “post office” on the islands and was established in 1793 by whalers. They placed a barrel just a bit inland and then wrote letters to be placed in the barrel. 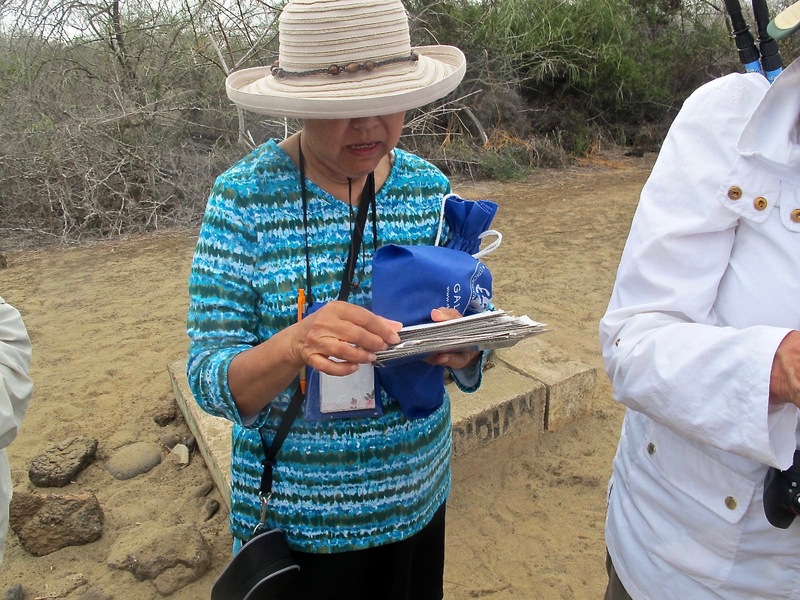 When another crew came there, they checked the letters and took the ones where they would be going. Sometimes it would take years for the letters to arrive but they did and were delivered by hand. The tradition still lives on and we were welcome to deposit letters in the barrel and take a letter back to the mainland. All of us sorted through many post cards to try to find some close to where we live or ones that we thought we could eventually deliver in person. I mailed two and took three to be delivered in Reno and California. I wonder how long it will take to get my post cards to Megan and Dalan. 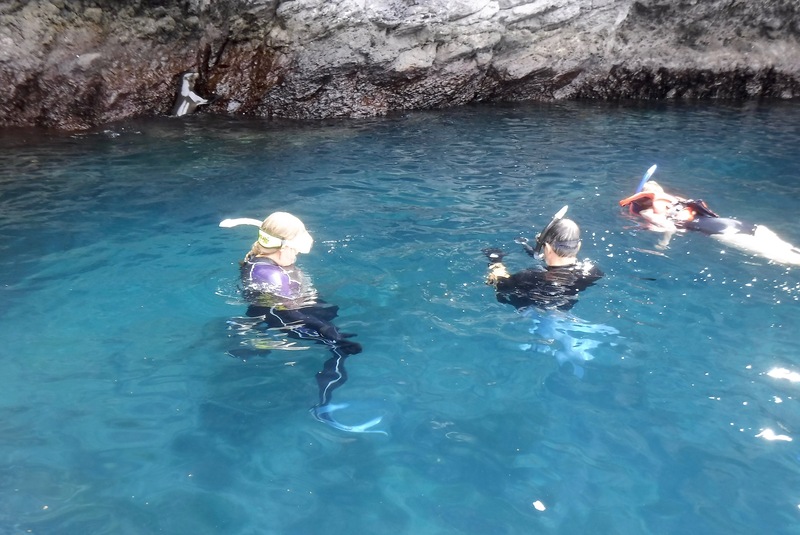 On our way to Cormorant Point, we stopped at Devil’s Crown to do some deep water snorkeling. 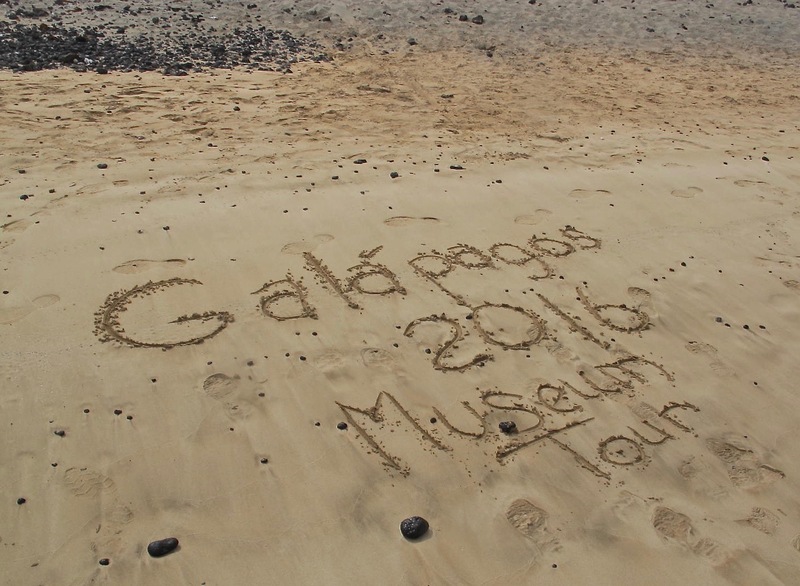 This is what Galápagos.com has to say about this place. 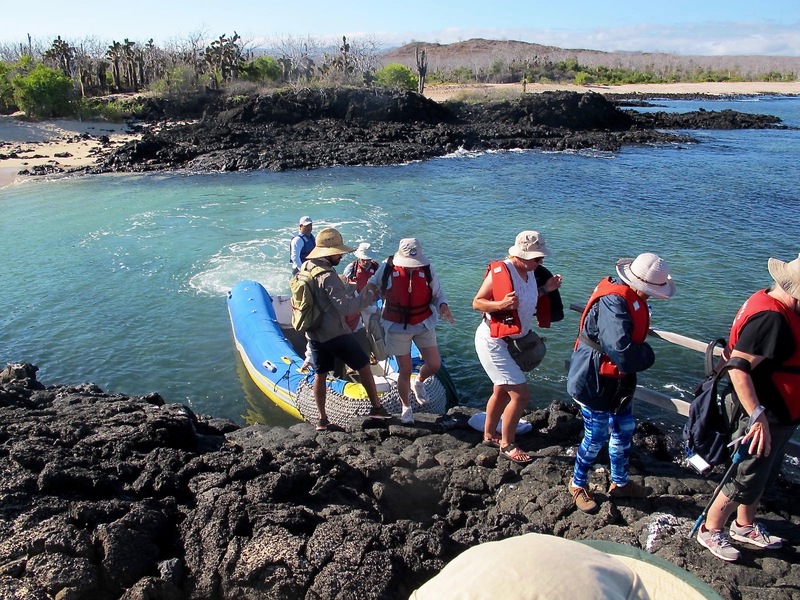 One of the best snorkeling sites in the Galapagos, this volcanic crater has been eroded by the waves leaving the northern and southern sides poking out of the water. The coral reef in the middle is perfect for attracting marine life. Snorkelers enjoy the variety of marine life and exciting currents that rush through the crown, creating an exhilarating experience. I think the profile of Devil’s Crown looks dangerous and intimidating. How about you? 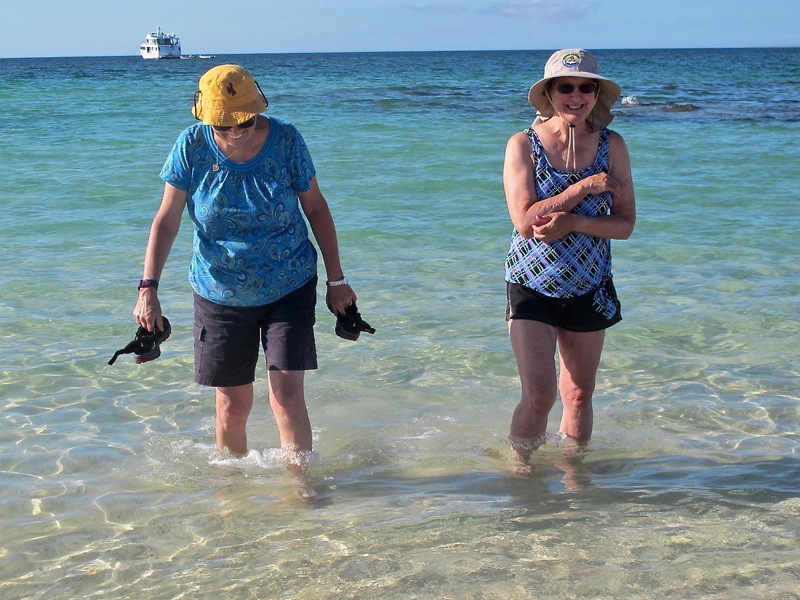 Those “exciting” currents were VERY strong currents for the majority of our snorkelers. We got off the Zodiac to the right of the right hand peak and before we could get ourselves oriented to landmarks and such, we had drifted alongside the far (western?) side of the Crown. Those rocks didn’t look friendly. 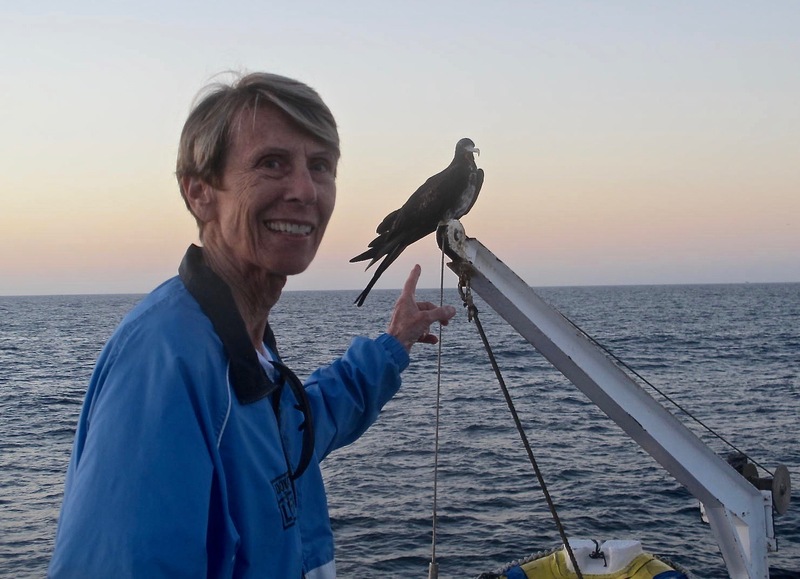 I didn’t see much marine life in that area and kept checking on Shirley to make sure she was ok. I was glad to see that she got back into the Zodiac before we drifted around the left end of the Crown, as I know she doesn’t care for rough water. She was able to get back into the water when she had caught her breath. She wasn’t the only one who got out of the water. The current coming out of the Crown was quite strong but I was able to swim against it and get in the middle where it was a bit calmer and clearer. 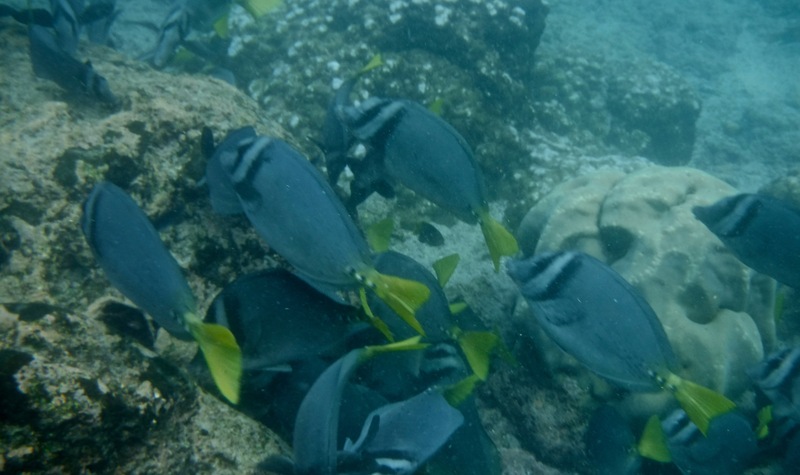 I didn’t see the advertised white tipped sharks hammerheads or sea lions, but did see some surgeonfish, coral and parrotfish. 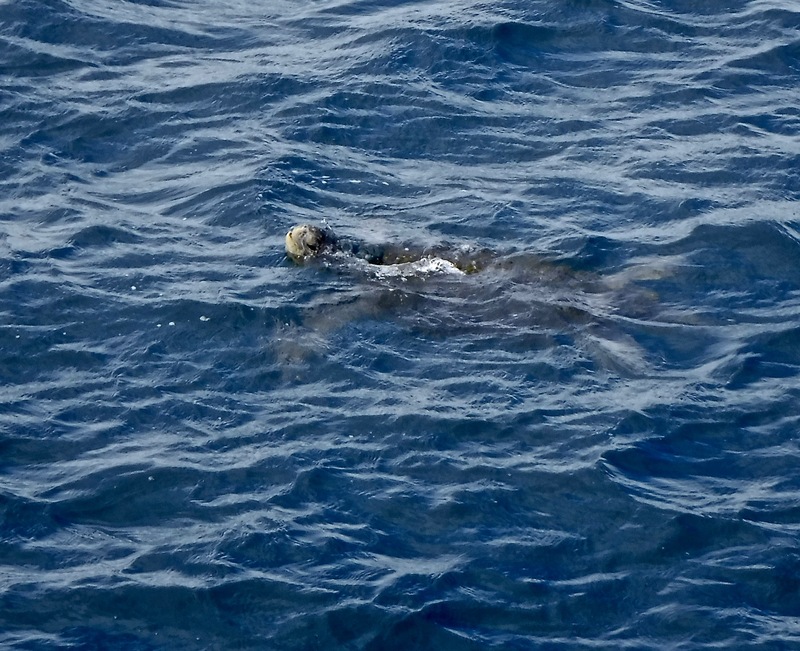 Just before we got into the Zodiac to go over to the Devil’s Crown, I espied a couple of sea turtles right beside the boat. We had time to shower and get cleaned up a bit before we set off for Cormorant Point. 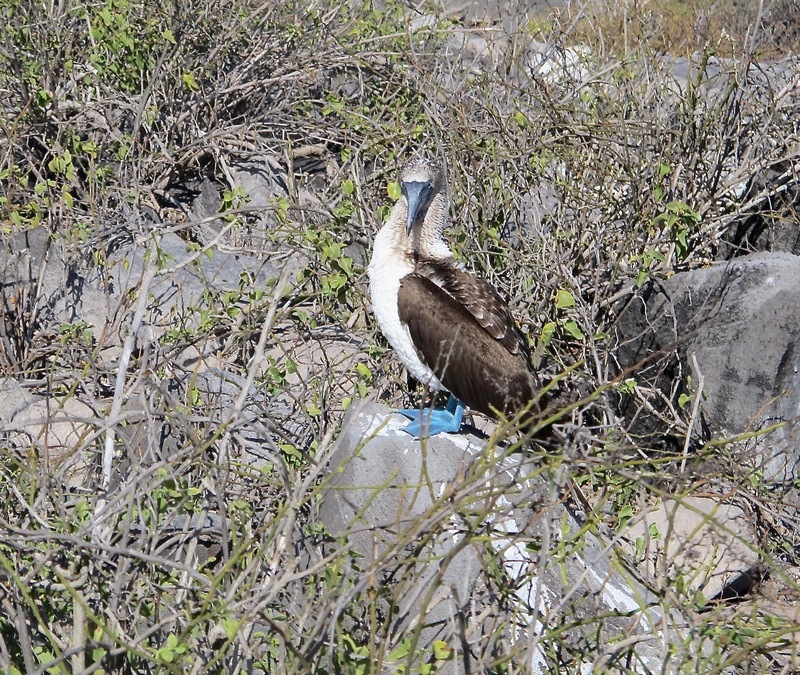 It’s noted for blue-footed booby nesting areas, some flamingos and a green beach. 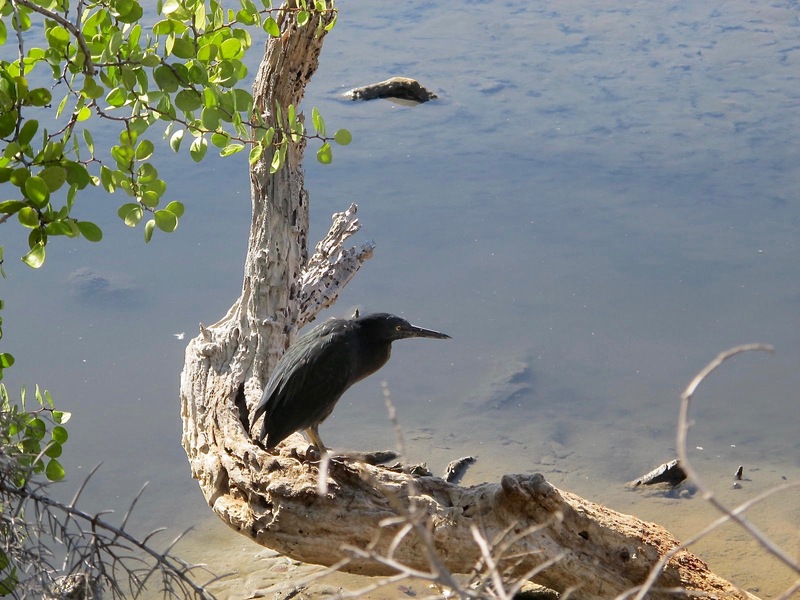 Despite its name, we never saw any cormorants. 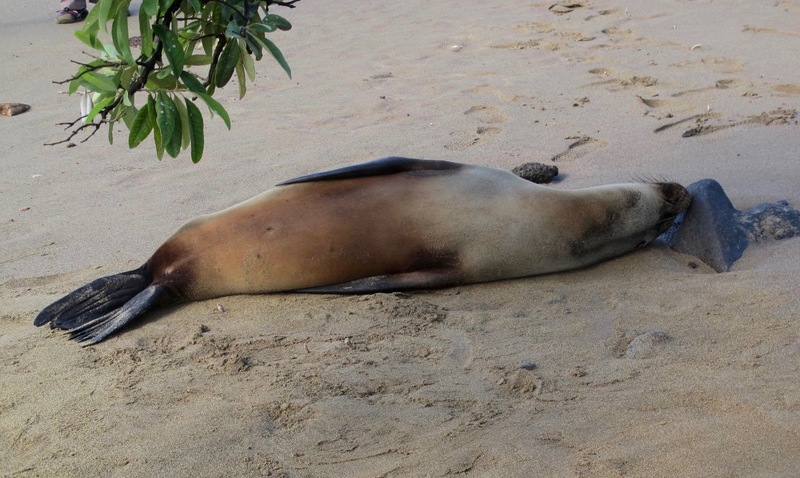 This sleepy head is resting on the Green Beach, so called because olivine (a green mineral) is prominent in the sand. 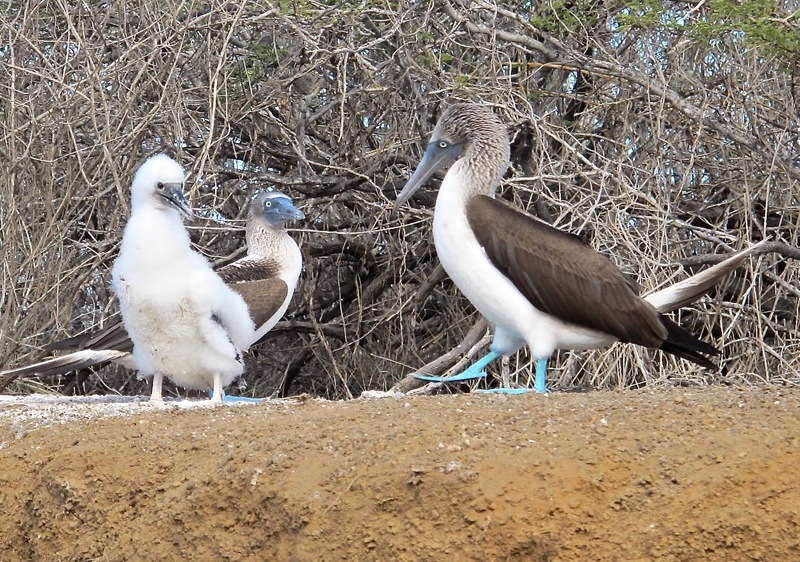 This blue-footed booby family was nesting on a short bluff above the sea lion. 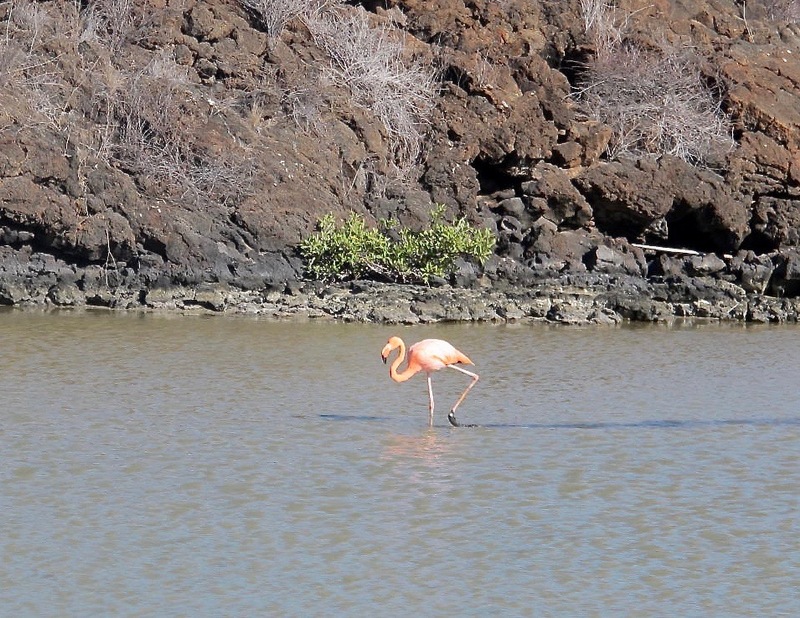 This saltwater lagoon is a flamingo area. 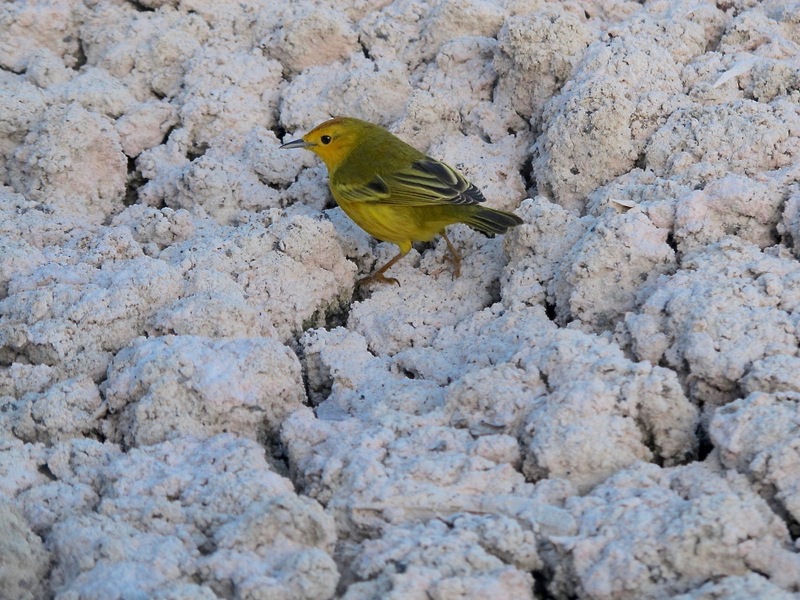 These tiny yellow warblers are all over the islands. This was the first time one was close enough to get a decent picture. 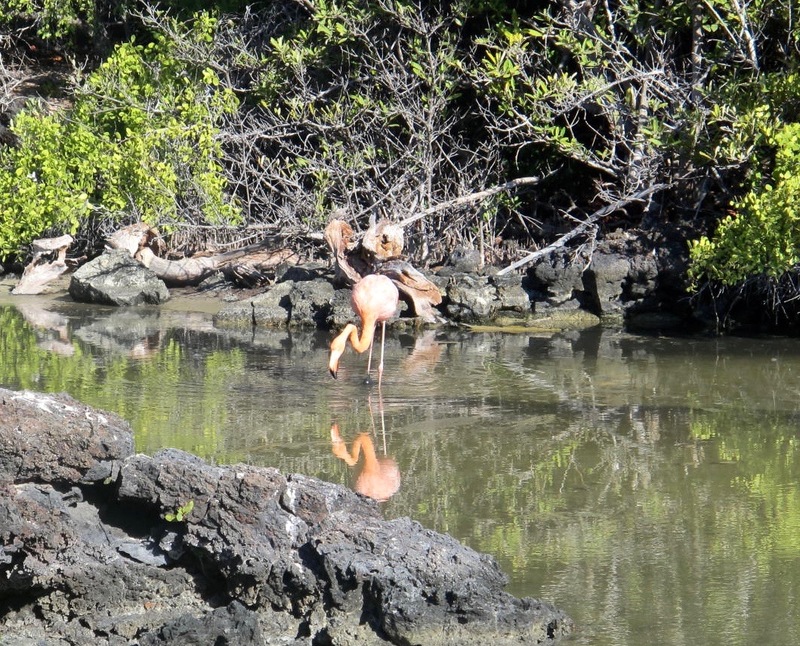 He was hopping around on a dried portion of the flamingo lagoon. 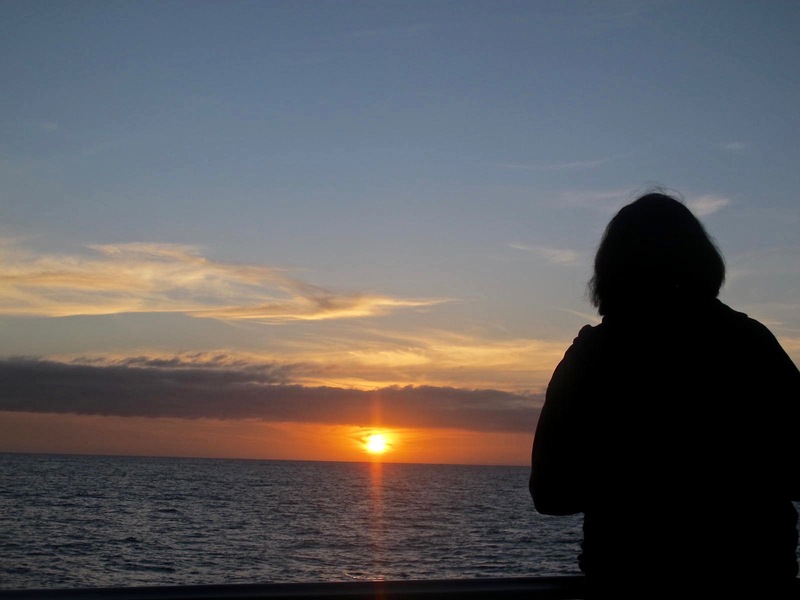 It was getting toward dusk when we made a move to return to the ship. There is a rule that all parties must be off the islands by 6 PM and I think we were pushing it a bit. 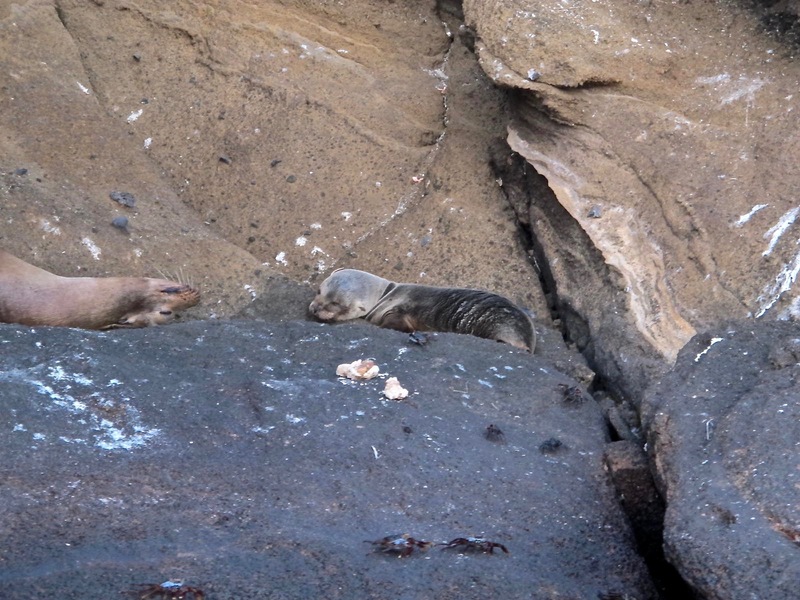 Our Zodiac jaunt took us by mama sea lion and her one-week old pup. I would not be my father’s daughter if I didn’t take some sunset pictures. 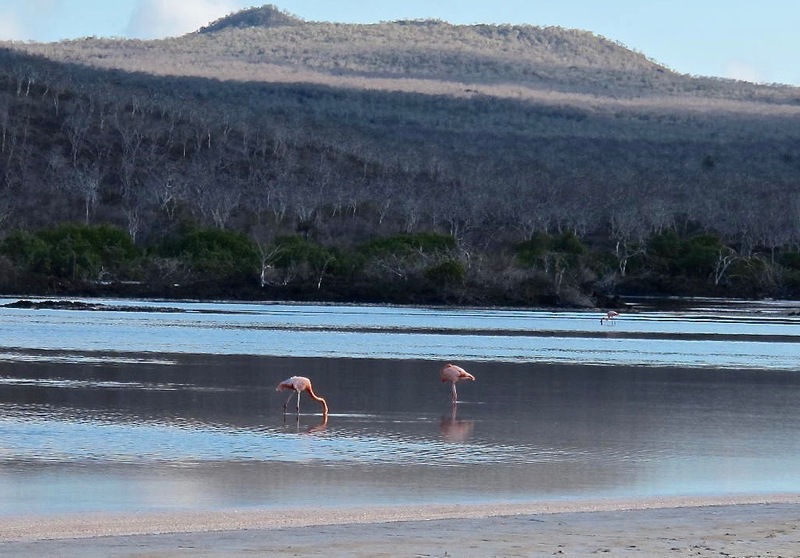 Floreana has been the most altered by human inhabitants. Invasive and feral goats devastated much of the natural ecosystems and removal of these goats from the park was only completed in 2007. I loved Floreana (as I did all the islands) and felt priveleged that we were able to visit it and appreciate what it has to offer. Coming soon! 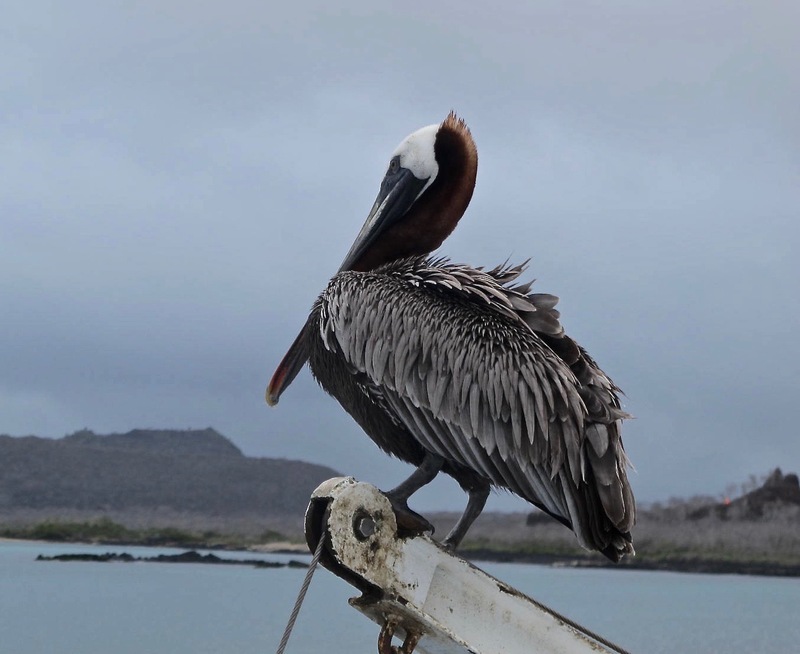 The ultimate installment of the Galapagos Adventure.